First post of the year!! Before I begin, let me take the chance to wish all of you a Happy New Year! May all your resolutions for 2015 come true! 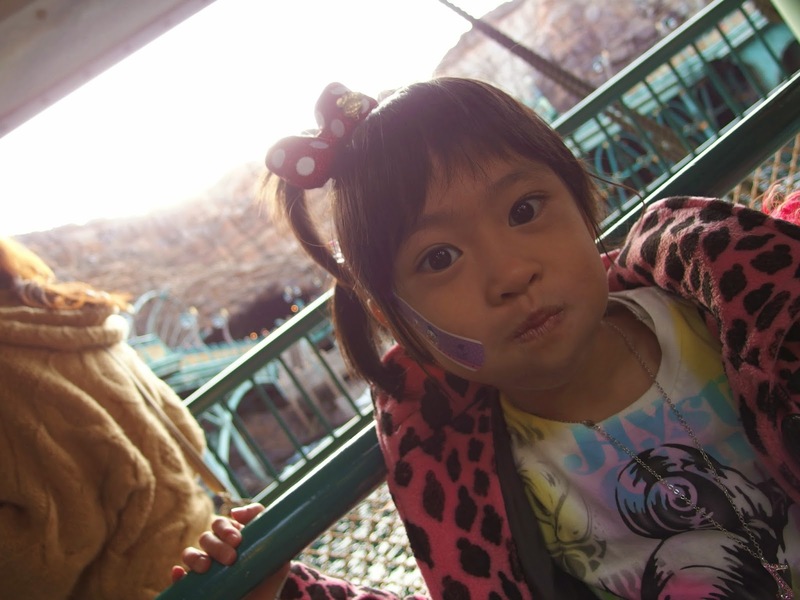 We shall now proceed to kick start the year at; Tokyo Disneysea! 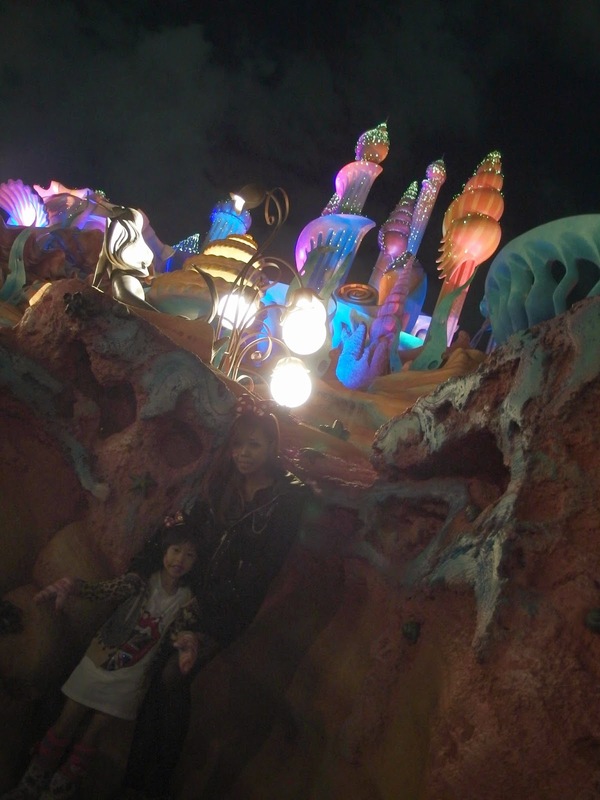 For the first half, we visited Disneyland and now…It was time for Disneysea! 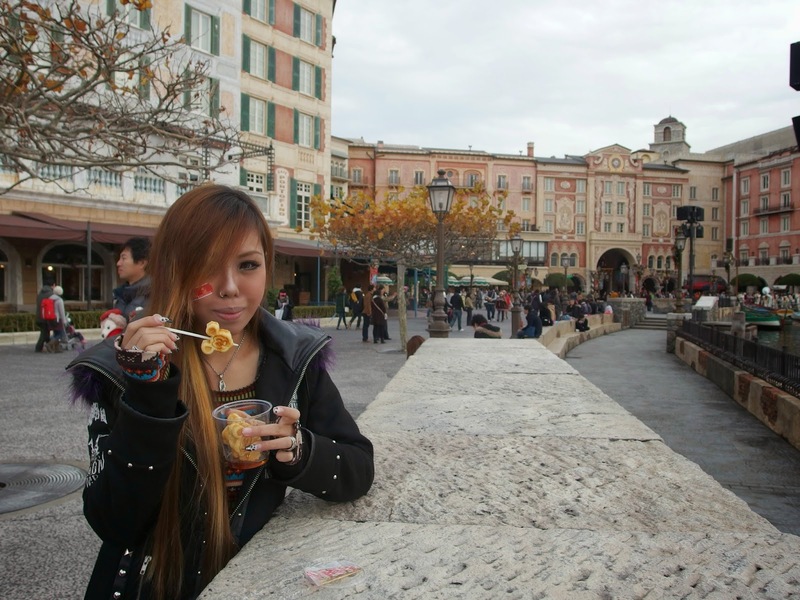 Anyway, I realized I actually did an entry on Tokyo Disneysea before. The link to it can be found above. Since it’s been covered previously, this entry will be similar to the one before. 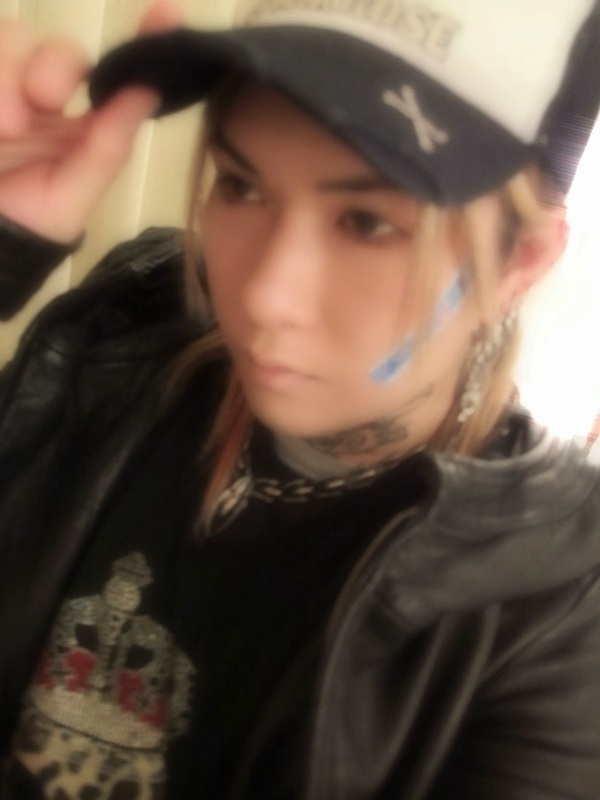 This entry will be themed in a similar fashion, only with with different pictures and people! We’ll be doing this in 2 Parts. This is Part 1! 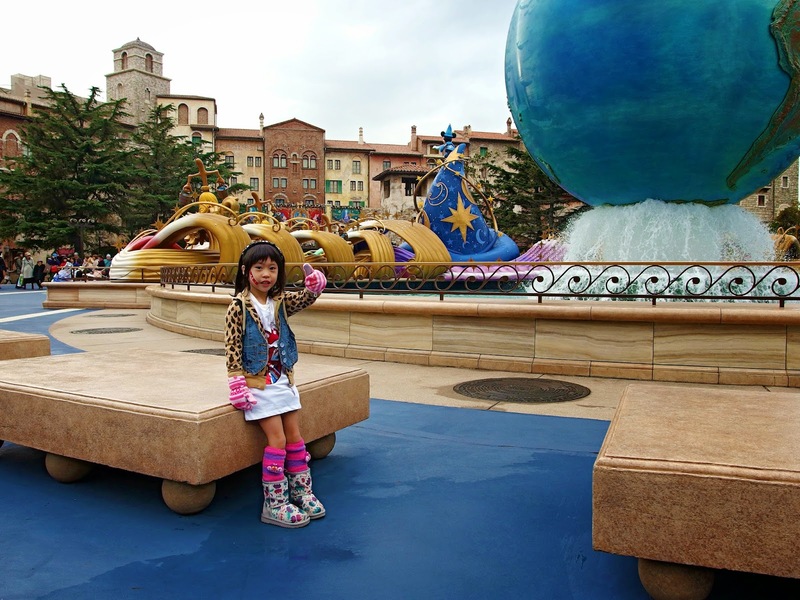 Tokyo DisneySea is a 176-acre theme park at the Tokyo Disney Resort located in Urayasu, Chiba, Japan, just a little outside Tokyo. It opened on September 4, 2001. 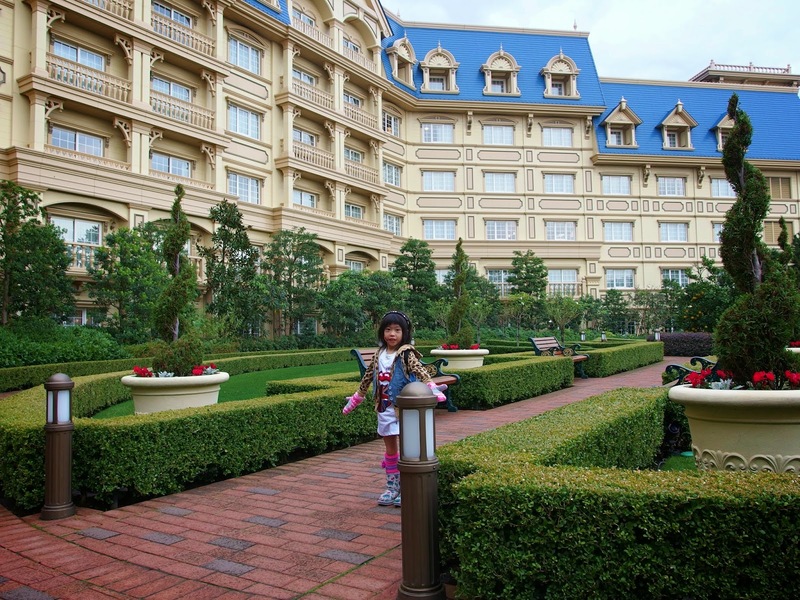 It is owned by The Oriental Land Company, which licenses the theme from The Walt Disney Company. 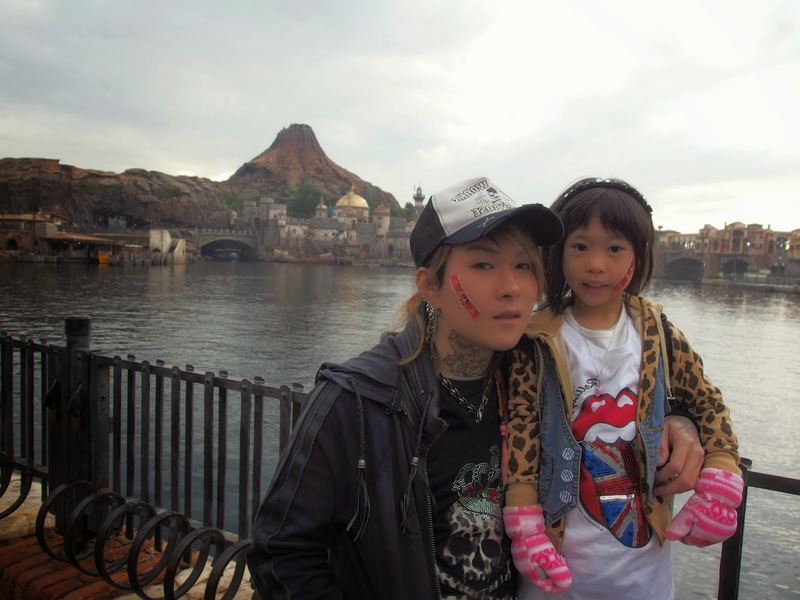 Tokyo DisneySea attracted an estimated 12 million visitors in 2009, making it the fifth-most-visited theme park in the world. 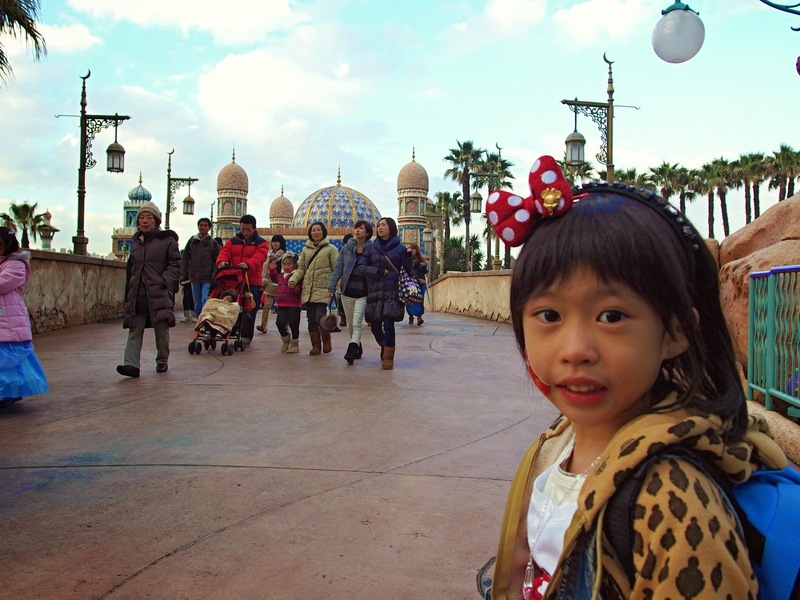 Tokyo DisneySea was the second theme park to open at the Tokyo Disney Resort and the ninth park of the eleven worldwide Disney theme parks to open. 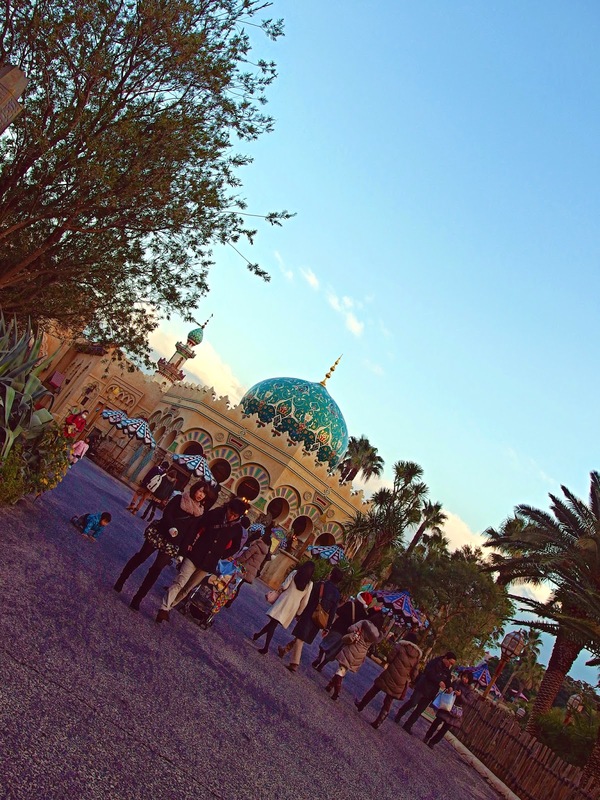 Tokyo DisneySea was the fastest theme park in the world to reach the milestone of 10 million guests, having done so in 307 days after its grand opening. 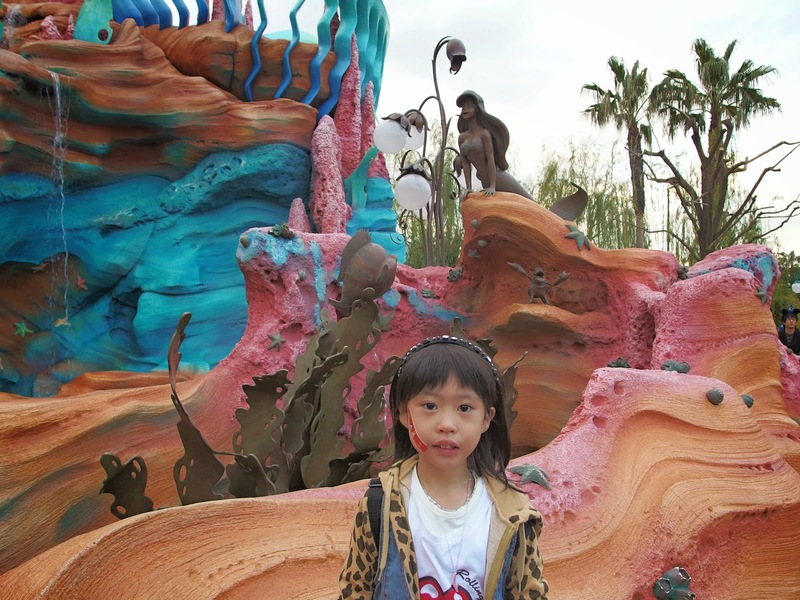 The previous record-holder was Universal Studios Japan; 338 days after its opening. 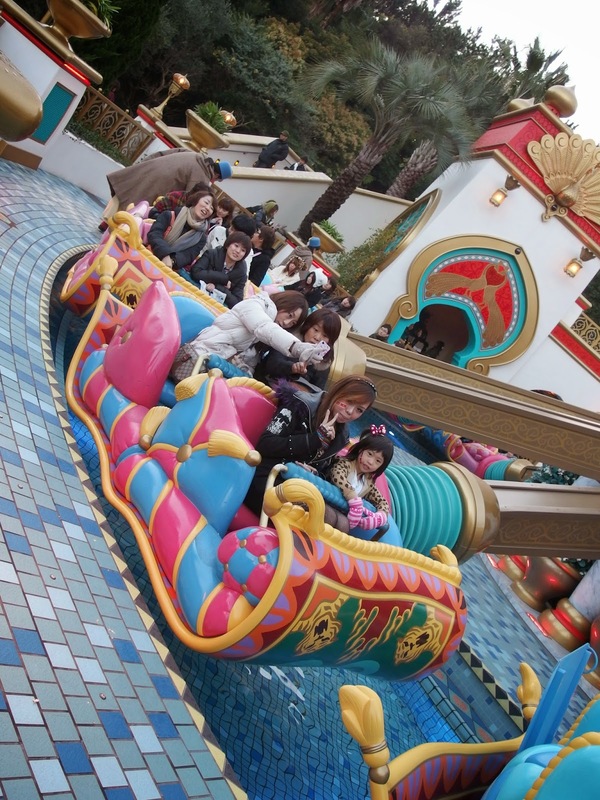 Tokyo DisneySea is also the most expensive theme park ever built, estimated to have cost over $4 billion U.S.D. 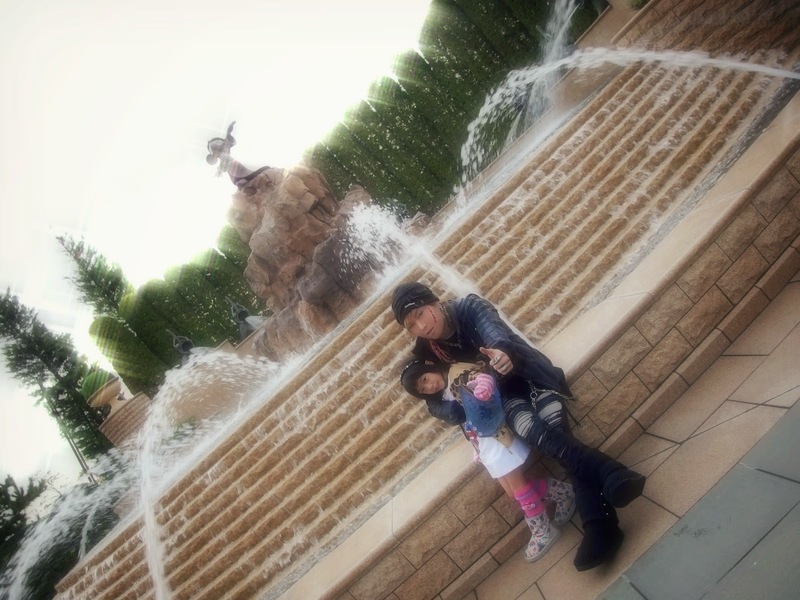 Tokyo DisneySea and its companion park Tokyo Disneyland are the only Disney parks in the world not owned by The Walt Disney Company. 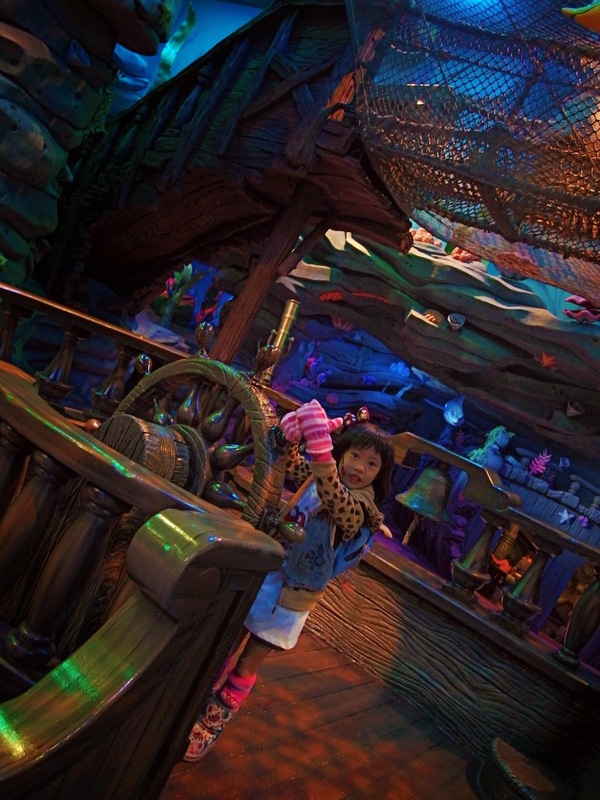 Tokyo DisneySea has an overall nautical exploration theme to it. The idea for the park can be traced to a proposal to build a second theme park in Southern California called “DisneySeas” in Long Beach, California. 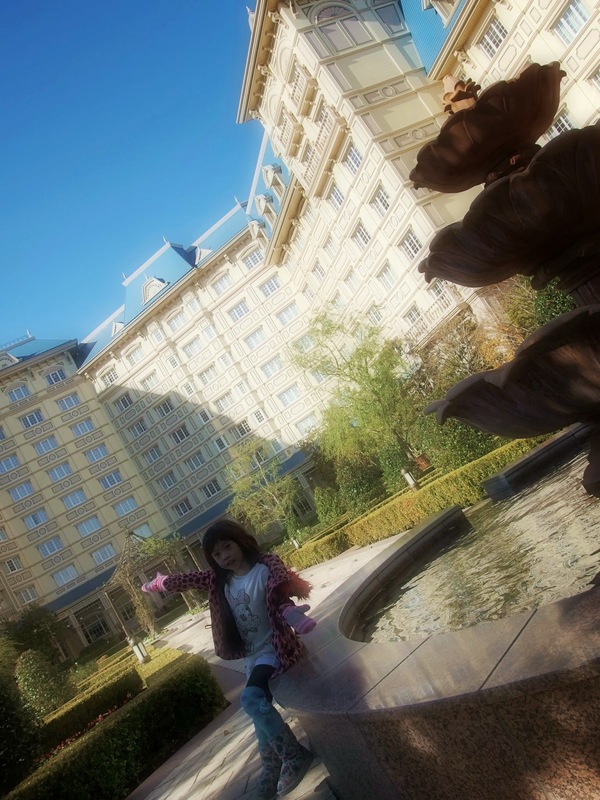 However the idea was scrapped after the company endured financial trouble with the Euro Disney project. Later the idea was passed on to the Oriental Land Company to expand their resort. 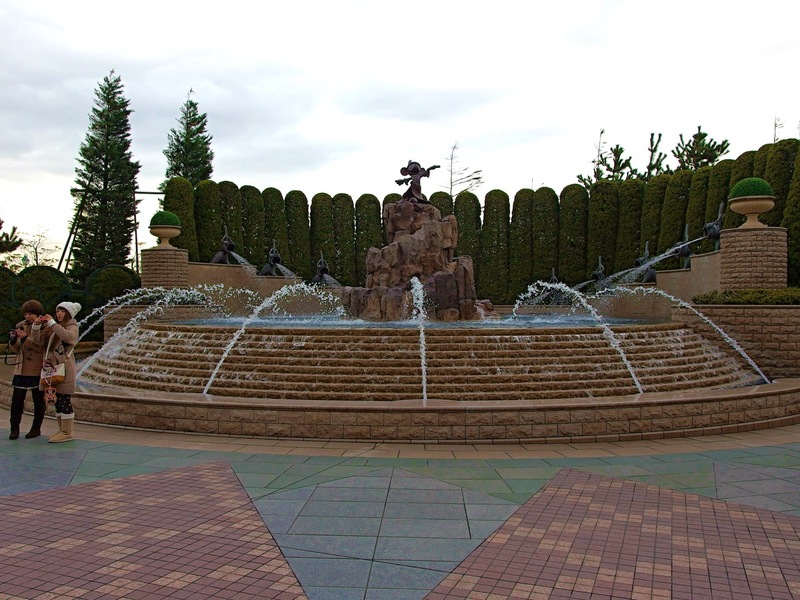 Unlike Tokyo Disneyland, the overall intention was to create a more adult-themed park, including faster, scarier rides and shows designed more for an older audience. 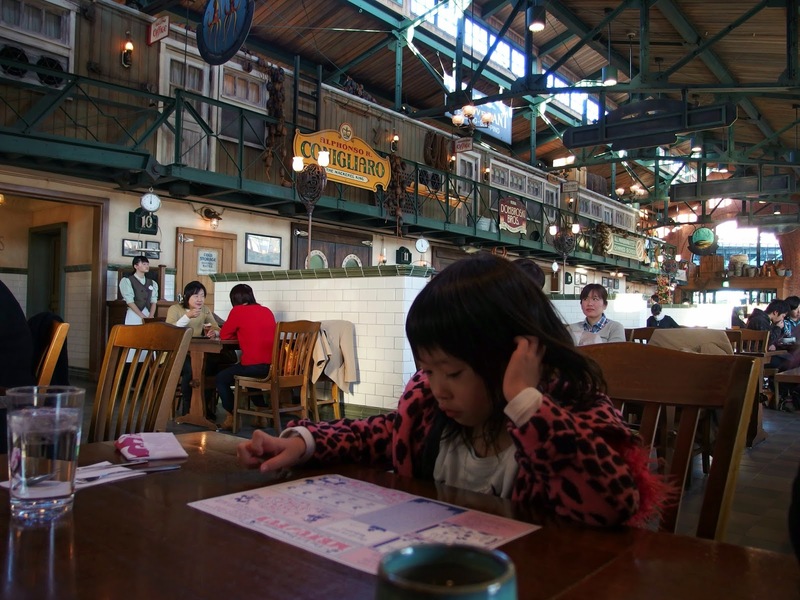 By the time Tokyo DisneySea opened in 2001, its concepts and designs had been in development at Walt Disney Imagineering for well over 20 years. 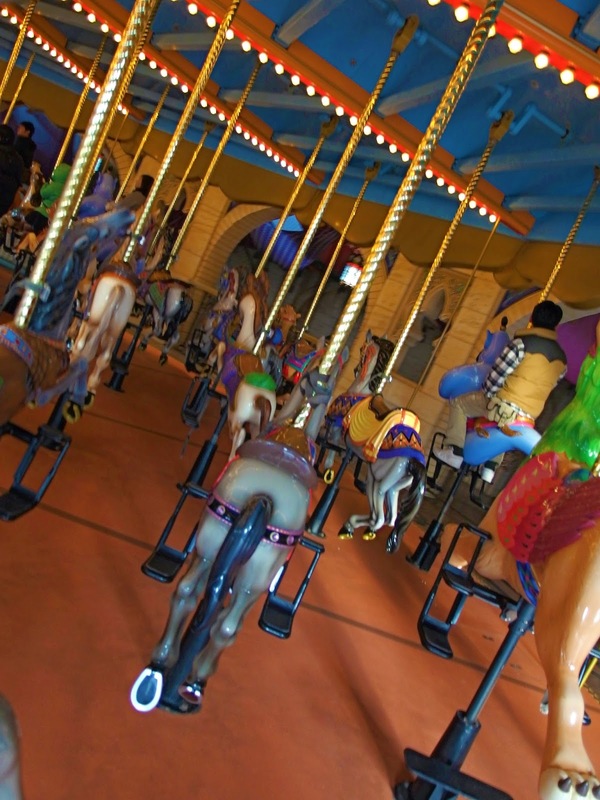 There are seven uniquely themed areas or “ports of call”. The entrance to the park is Mediterranean Harbor, which opens up to six more nautically themed ports: American Waterfront, Lost River Delta, Port Discovery, Mermaid Lagoon, Arabian Coast, and Mysterious Island. 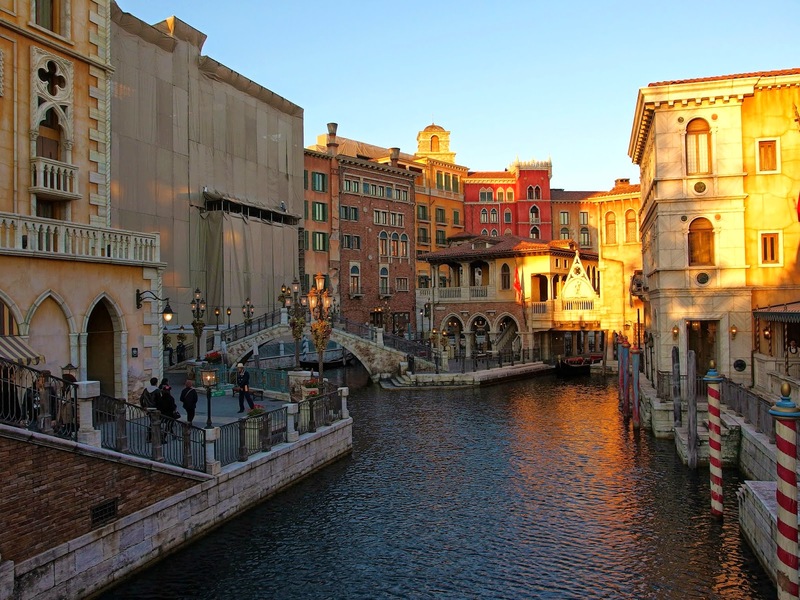 Mediterranean Harbor is the entrance “port-of-call” and is “Italy themed“. A port city, complete with Venetian gondolas that guests can board and ride. Littered throughout the port, you can find various food in many different shops and restaurants. Come dinner, you’ll be spoiled for choice! Mediterranean Harbor’s layout differs from the entry “lands” of other Disney parks as it is a large “V” shape rather than a main street that leads to a hub as found in Disneyland’s Main Street, U.S.A. or Disney’s Hollywood Studios’ Hollywood Boulevard”. 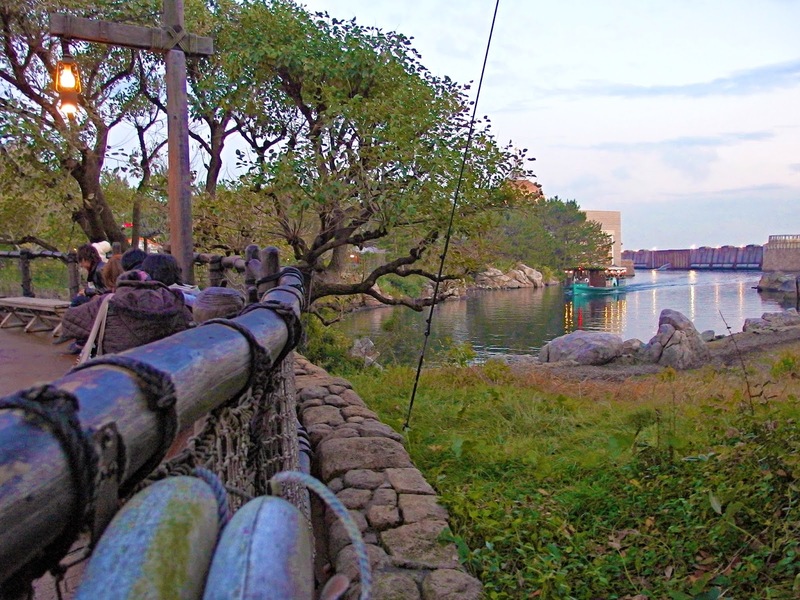 If followed to the right, the path leads to Mysterious Island, while if followed to the left, the path leads to the American Waterfront. 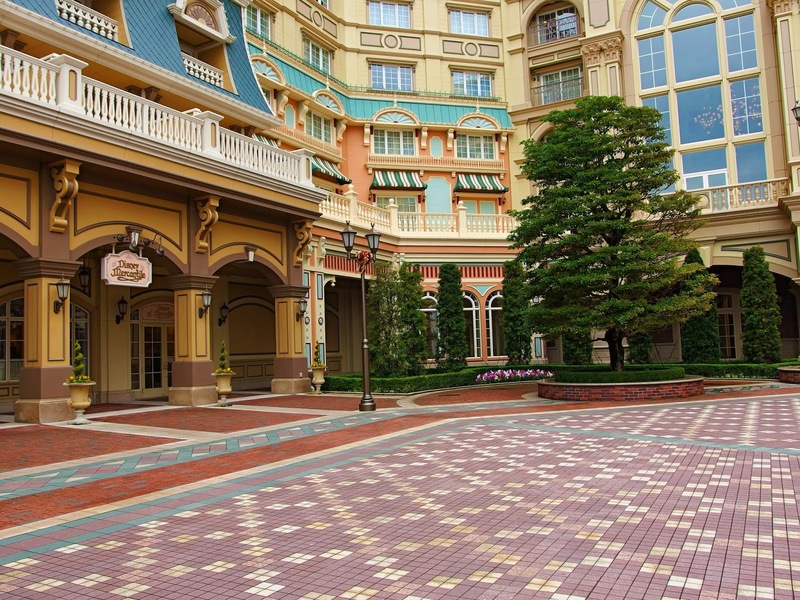 Built into the architecture in this port is the Tokyo DisneySea Hotel MiraCosta. 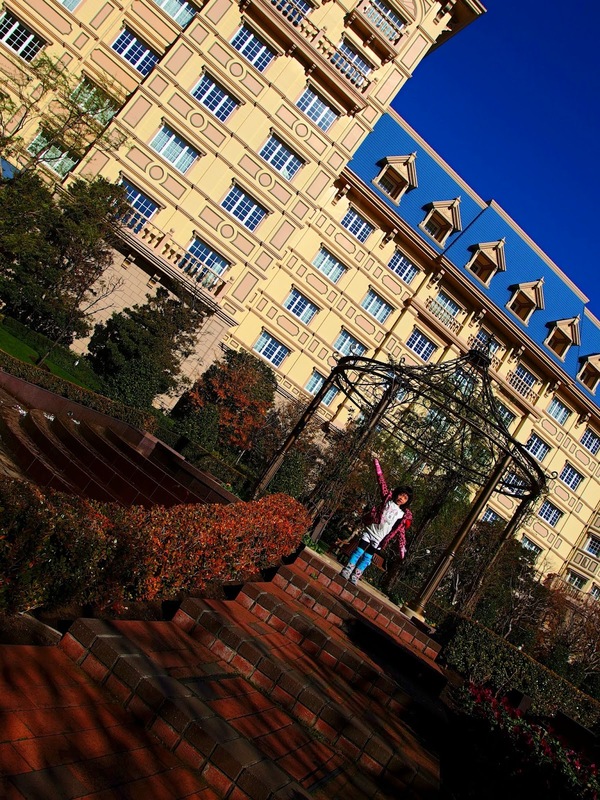 The hotel itself serves as a full-scale reproduction of the various buildings of Portofino and the ports of Venice. 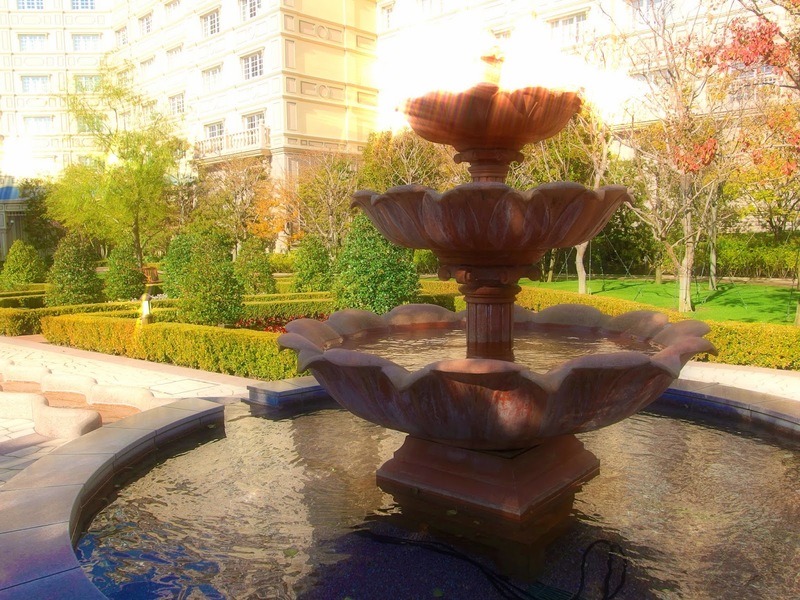 The design choice of combining a real hotel within the themed park areas helps to further the illusion that (as either a park or hotel guest) you are in the actual city; since the hotel is a functioning building rather than a ‘set facade’ – the general standard in theme park designs – the hotel guests that may peek out from the hotel’s rooms, balconies, and terraces serve in adding an almost surreal level of kinetic authenticity in passing for an authentic Italian villa for park visitors, while the hotel guest enjoys the harborside views and novelty of location. 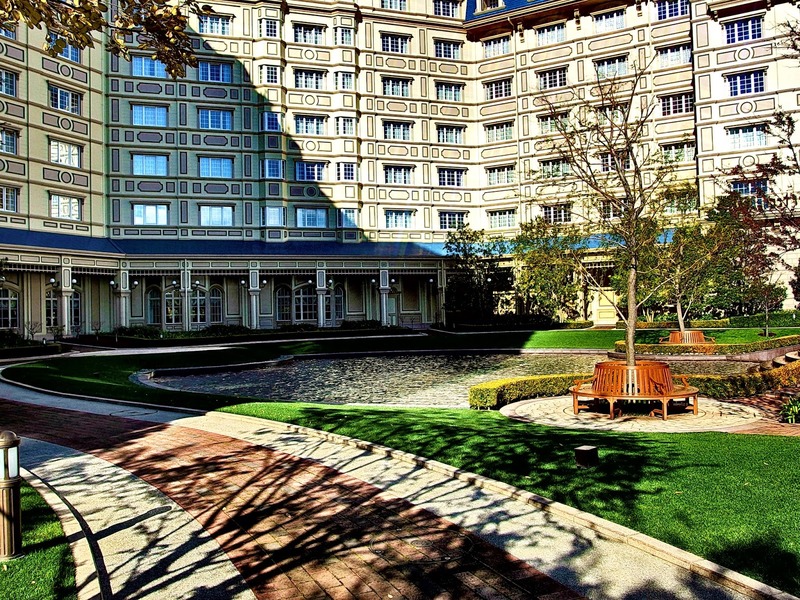 Additionally, the Hotel MiraCosta also serves as the southern berm – or border, of the park. The Legend of Mythica, a twenty-five minute show located on the harbor, and Fantasmic!, premiered on April 28, 2011, as part of the parks 10th anniversary celebration, “Be Magical!” a nighttime spectacular also situated on the harbor that uses special barges, fountains, pyro effects, Disney Characters and fireworks. 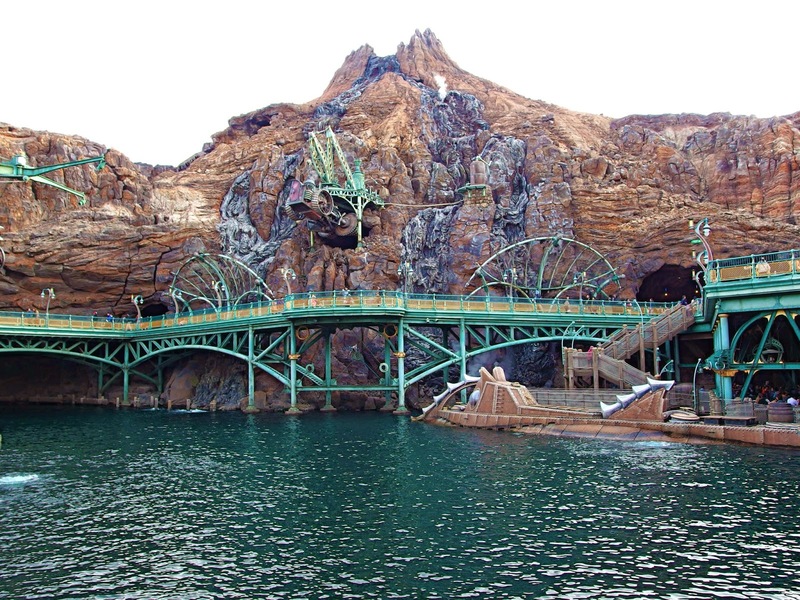 Mysterious Island is a “port-of-call” (themed land) at Tokyo DisneySea in the Tokyo Disney Resort. 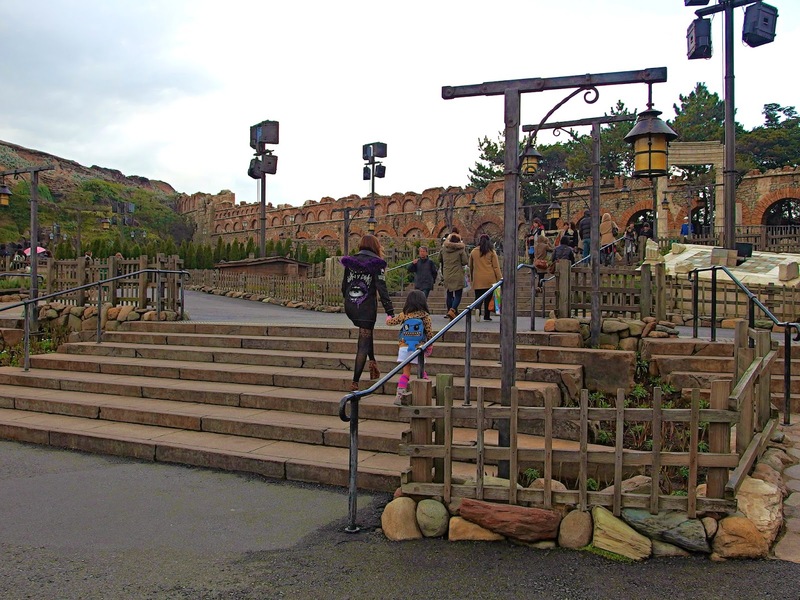 Featuring Mount Prometheus, a huge volcano and being located in the center of the park, it has become its icon. This Island is the one from Jules Verne’s novel, The Mysterious Island, which is Captain Nemo’s lair, as the reader finally discovers. It is also known as Vulcania Island, as featured in the Disney movie 20,000 Leagues Under the Sea. 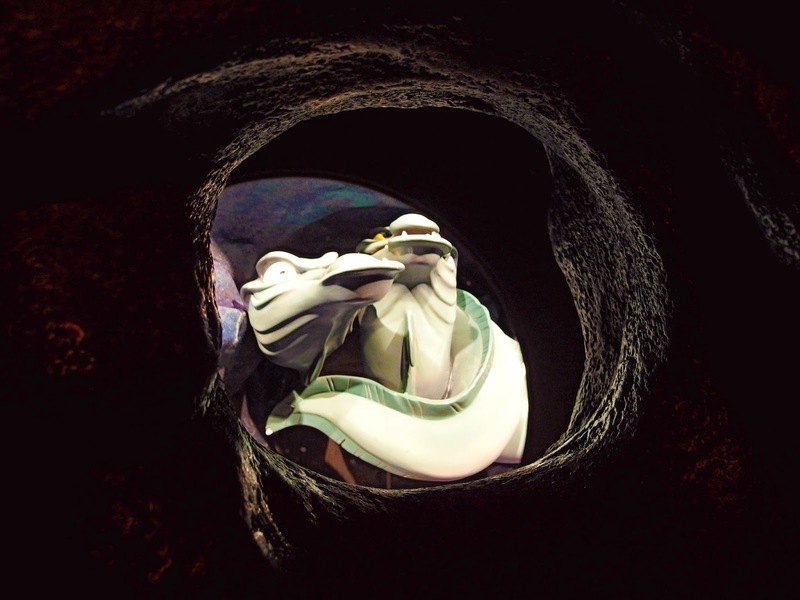 When guests enter the Island, they discover Nemo’s secret base, complete with a harbor for his Nautilus, as long as a lab inside the volcano, known as Mount Prometheus. 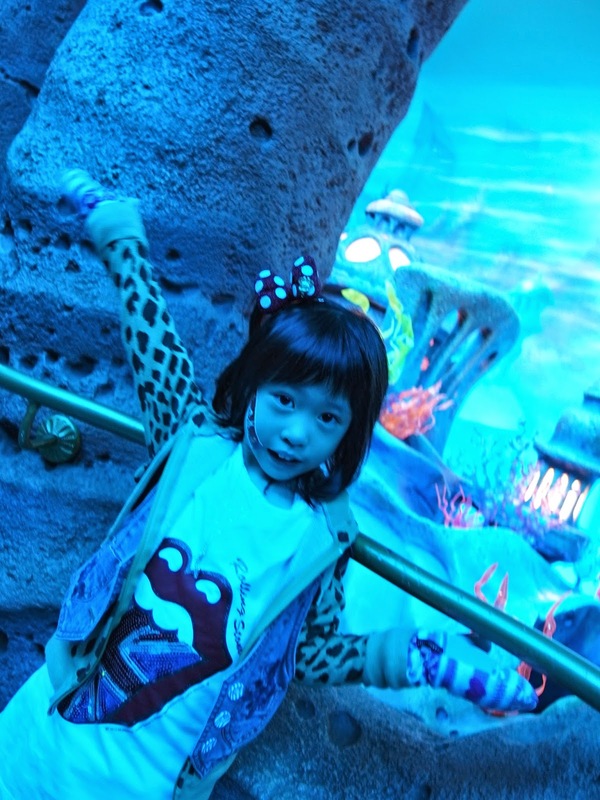 Nemo is indeed both exploring the depths of the Sea and of the Earth, which allows guests to experience two of Verne’s most famous adventures : 20,000 Leagues Under the Sea and Journey to the Center of the Earth. Despite its name, Mysterious Island is not an actual island. 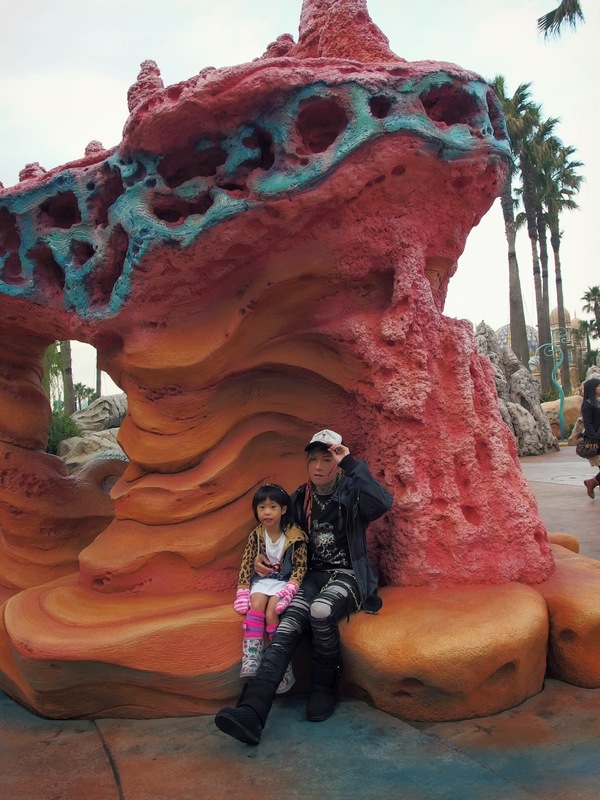 It is instead built into the side of Mount Prometheus. This volcano is “active” (since bursts of fire can be seen escaping from the top, bursts of steam from cracks in its side, or bursts of water from the lake). 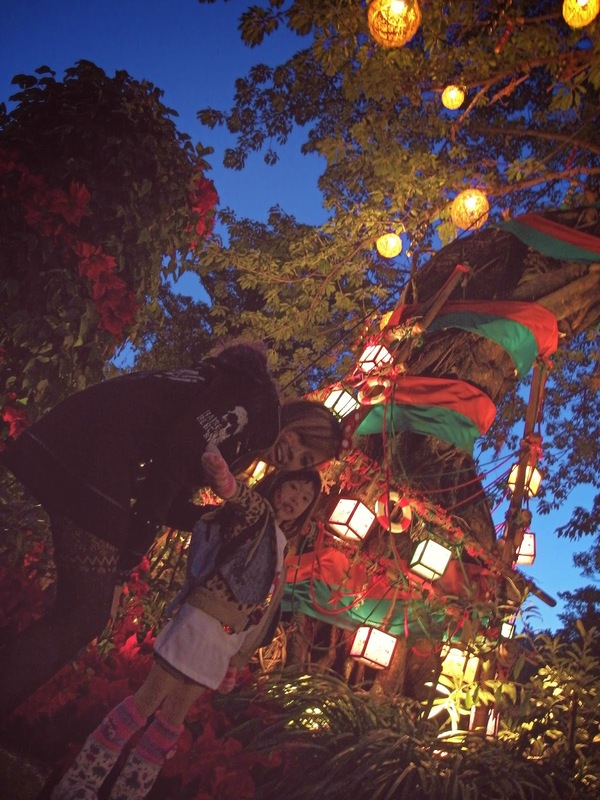 The area has little greenery, and is mostly rocks and ornaments (as one can see it in the movie). 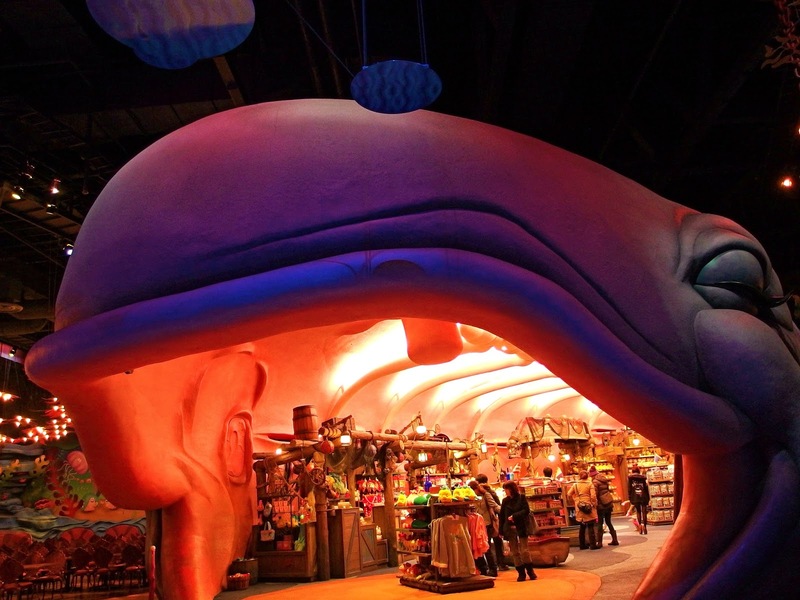 20,000 Leagues Under the Sea is a dark ride attraction at Tokyo DisneySea at the Tokyo Disney Resort in Japan. It is a submarine-type attraction and is based on the Jules Verne novel Twenty Thousand Leagues Under the Sea and its 1954 Disney adaption. 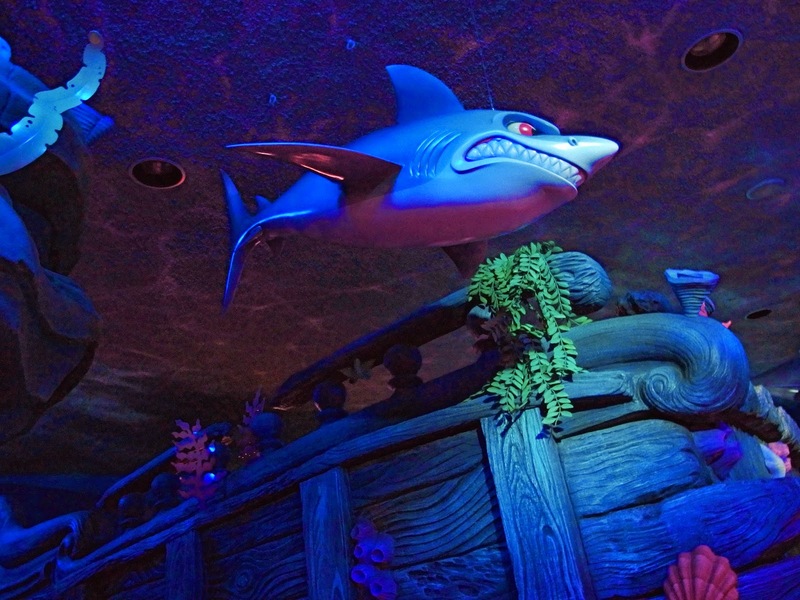 The attraction has a narration and is quite unique in many ways to other submarine-type attractions in other Disney parks. 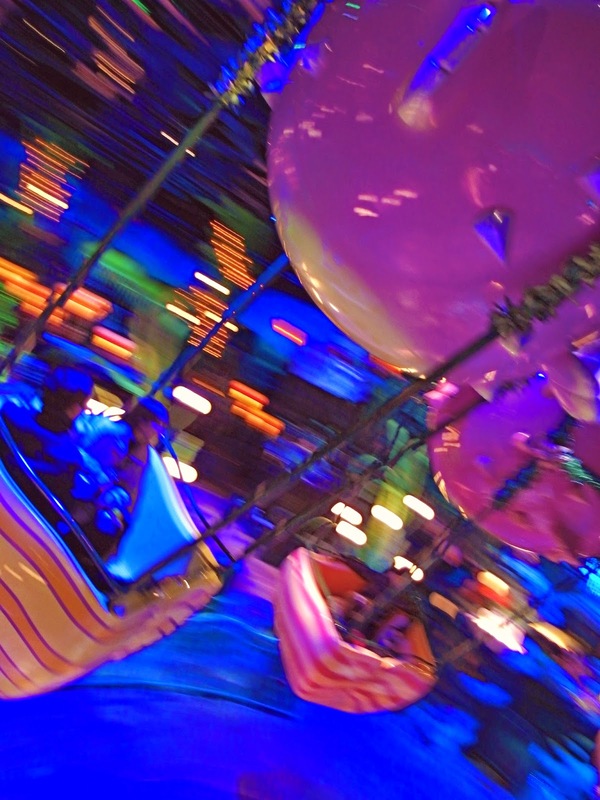 After all, the ride vehicles are suspended from an overhead track and does not actually travel underwater. The double pane glass dome windows, contains the water and the bubbles to create the illusion of the submarines diving deep into the ocean. 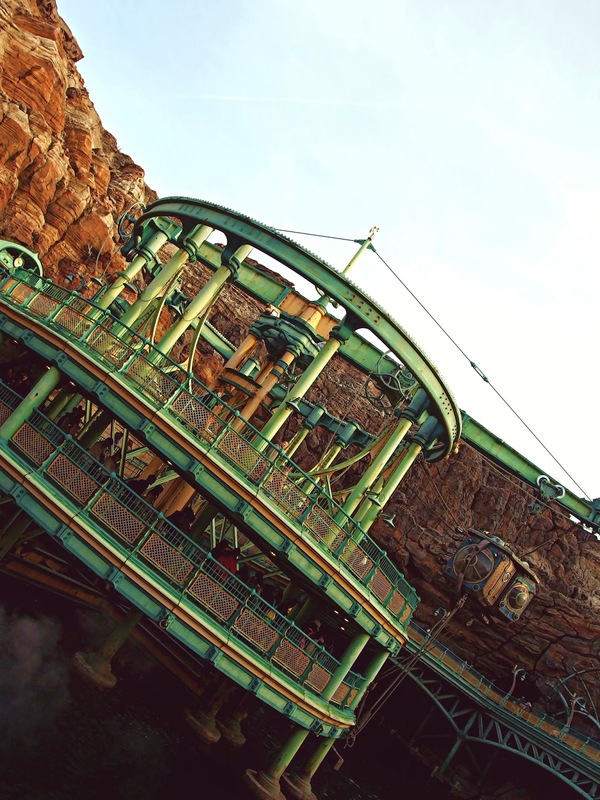 Guests can see Captain Nemo’s Nautilus and the entire fleet of sub 157 “Neptune” hanging from a crane beside the spiral portion of the outdoor queue which is the vehicle-type for the main ride. 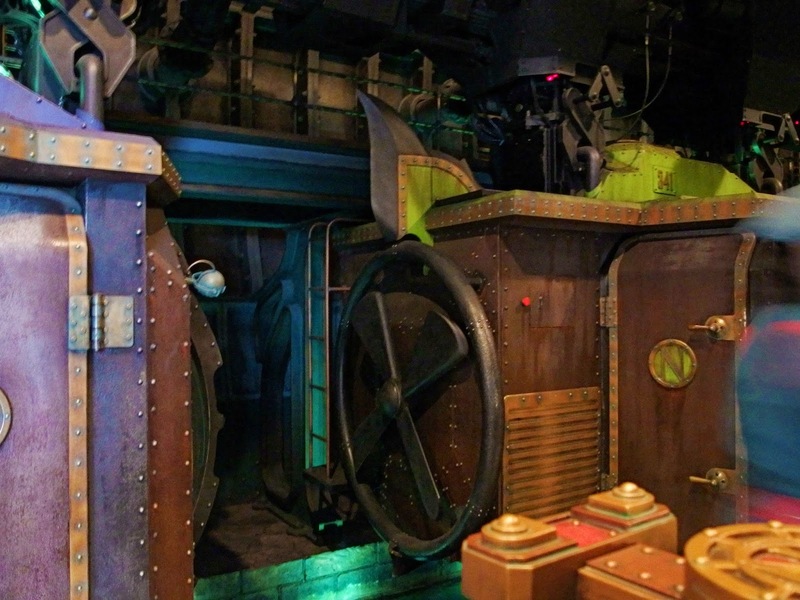 The inside queue takes guests past diving gears, Captain Nemo’s planning equipment and offices. 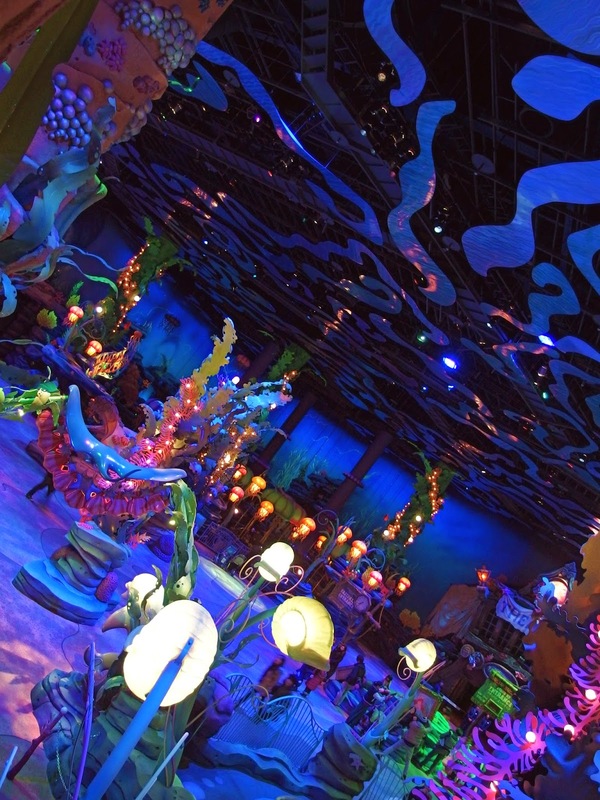 Inside “Neptune” (the ride vehicles), guests sit on small benches and each of the three bench seats has a view from its own porthole as guests tour the ships graveyard of “Kraken Reef”, and then fall down into “Lucifer’s Trench” where the mysteries and dangers of the deep become all to real. 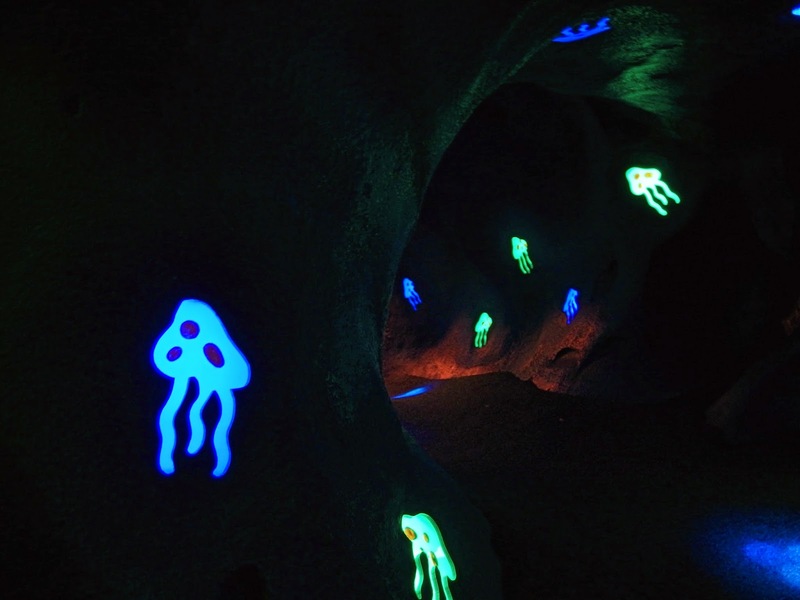 There is also a joystick controller at each window to give the guests a chance to manoeuvre an underwater lamp to illuminate treasure and terror. 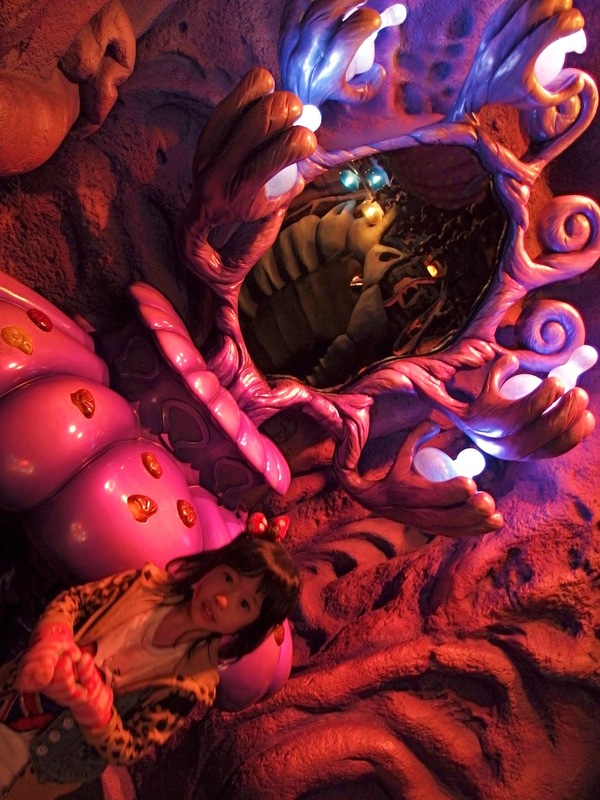 Journey to the Center of the Earth is an attraction at Tokyo DisneySea which is based on the Jules Verne novel Journey to the Center of the Earth. It uses similar technology to Epcot’s Test Track. 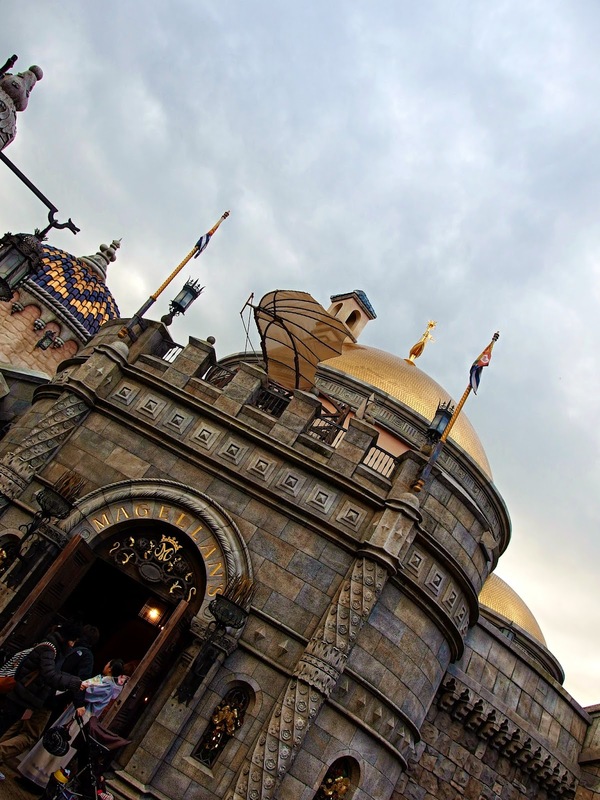 The attraction is located at Mount Prometheus which is the icon of Tokyo DisneySea. The volcano of Mysterious Island, Mount Prometheus, has become Captain Nemo’s base. 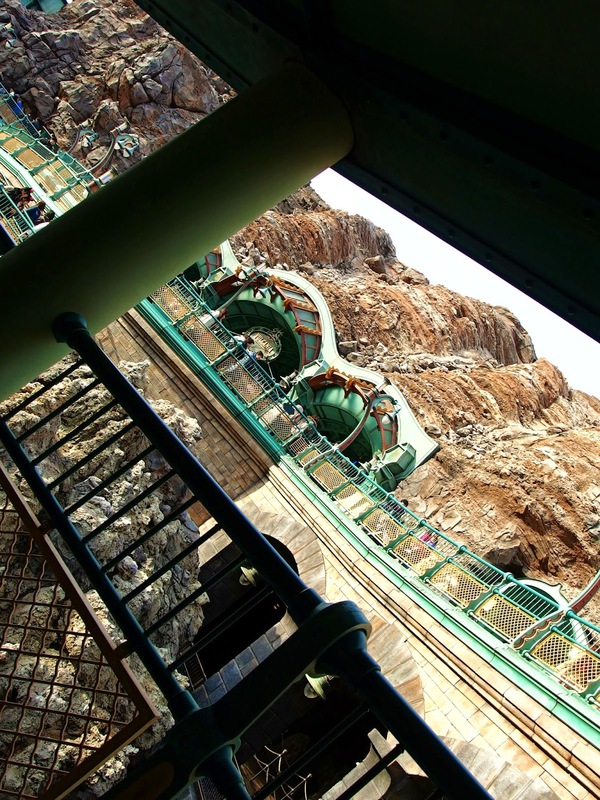 After travelling through its caverns, now guests board “Terravators” (which are elevators) to the facility’s base station which is one half mile below. In the base station is a communication center which is currently giving warnings of increased volcanic activity, but the scientist who mans it is currently away on tea break. Guests then board steam-powered mine vehicles that travel through pre-drilled tunnels into the heart of the Earth. 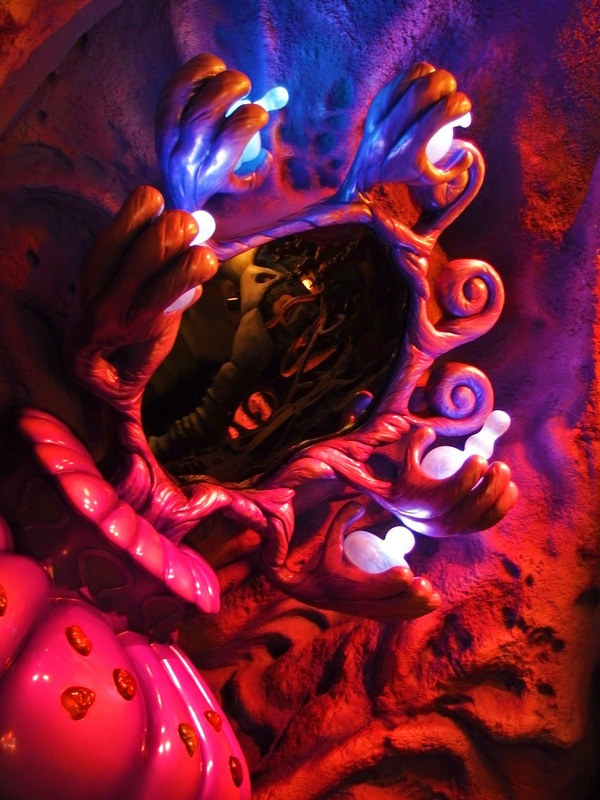 The ride begins through a cavern of colorful glowing crystals, before entering a giant Mushroom Forest, which is inhabited by strange insect amphibian-like life forms. Before the car can proceed further, an earthquake causes a cave-in of the tunnel ahead, forcing the car off its planned route and down a side branch filled with giant egg-life sacks. The car emerges on the shore of the Subterrenean Sea, and is nearly stuck by a lightning from the electrified gas clouds. 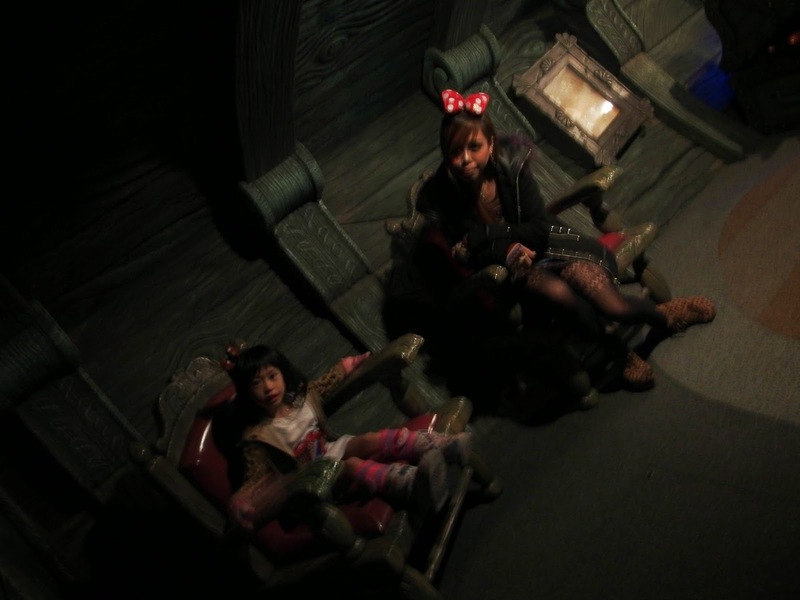 The finale comes when guests are forced into the fiery heart of an active volcano (Mount Prometheus), where the guests come face-to-face with the giant lava monster that calls the Center of the Earth its home. All this before finally escaping back to the surface on the wave of an eruption. Journey to the Center of the Earth was originally planed to be a free-fall type ride as part of Discovery Mountain, which is a former Disneyland Paris concept in place of Space Mountain. 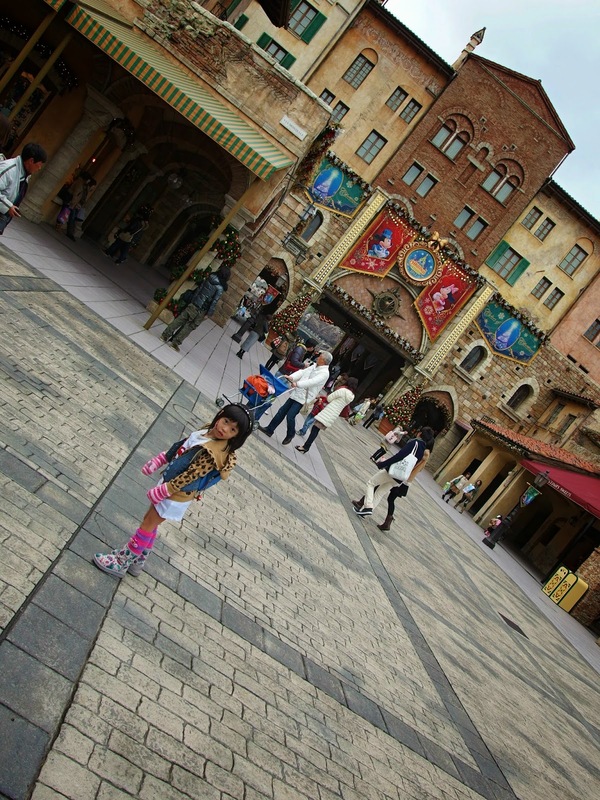 Since it was never built, the project reemerged in Tokyo DisneySea with a new technology. Its score was composed by Buddy Baker who was also responsible for the scores of rides such as Pirates of the Caribbean and The Haunted Mansion. 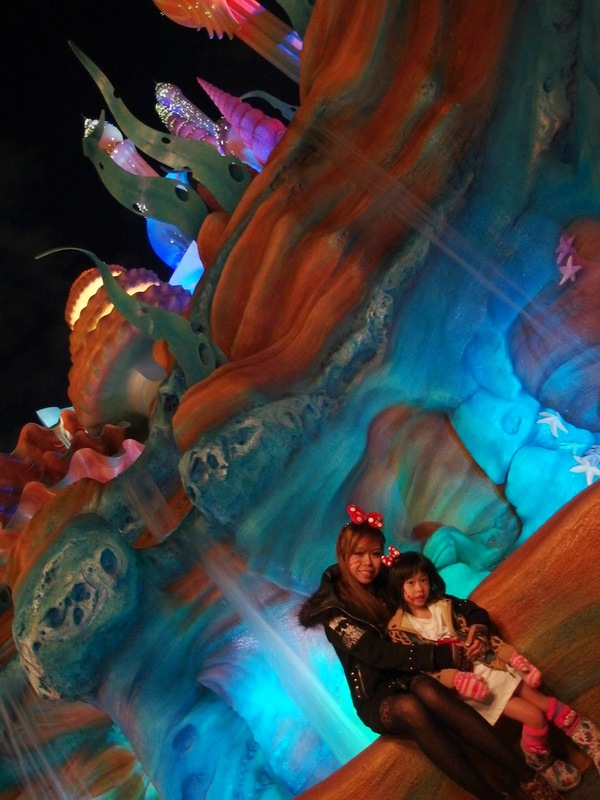 Mermaid Lagoon is a “port-of-call” (themed land) at Tokyo DisneySea in the Tokyo Disney Resort, it also a home to the characters of The Little Mermaid. 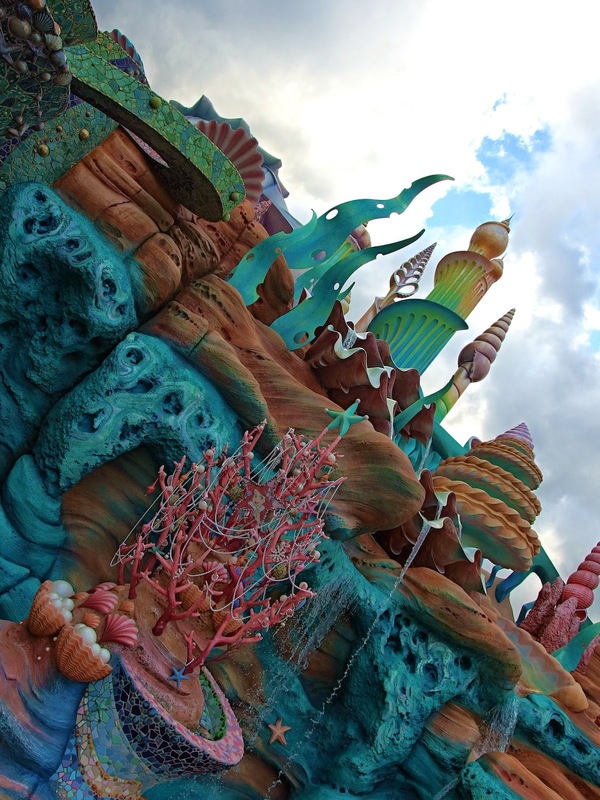 The facade is made to look like the Palace of King Triton and features fanciful seashell-inspired architecture. 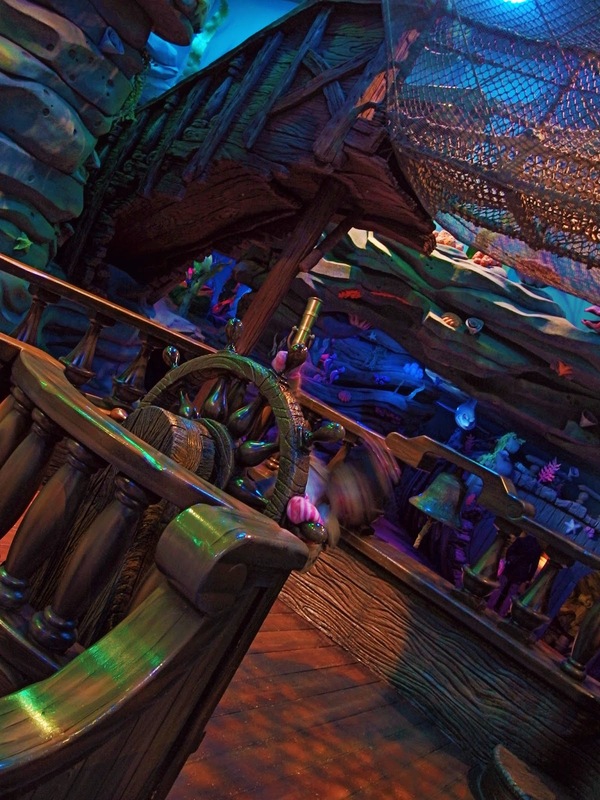 This “port of call” is unique in that it is mostly indoors and recreates the feeling of being underwater. 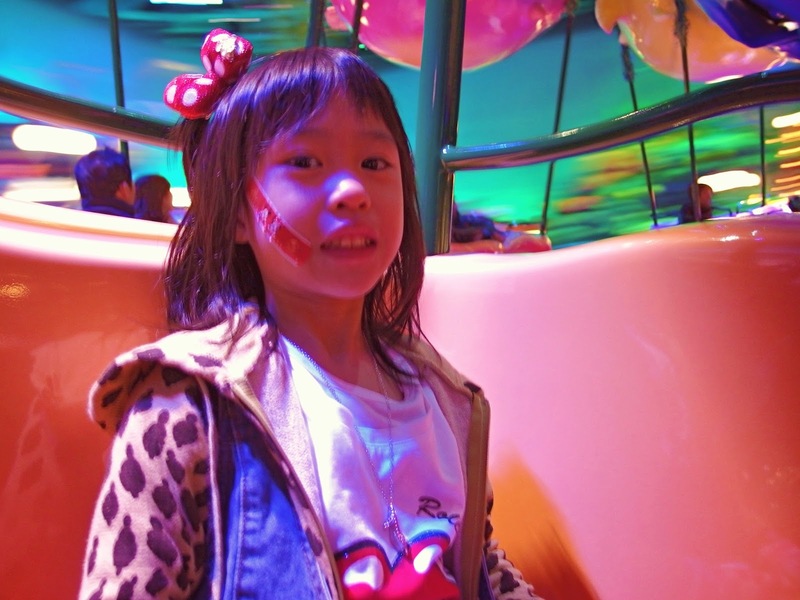 Most of the rides in this area are geared towards younger children. 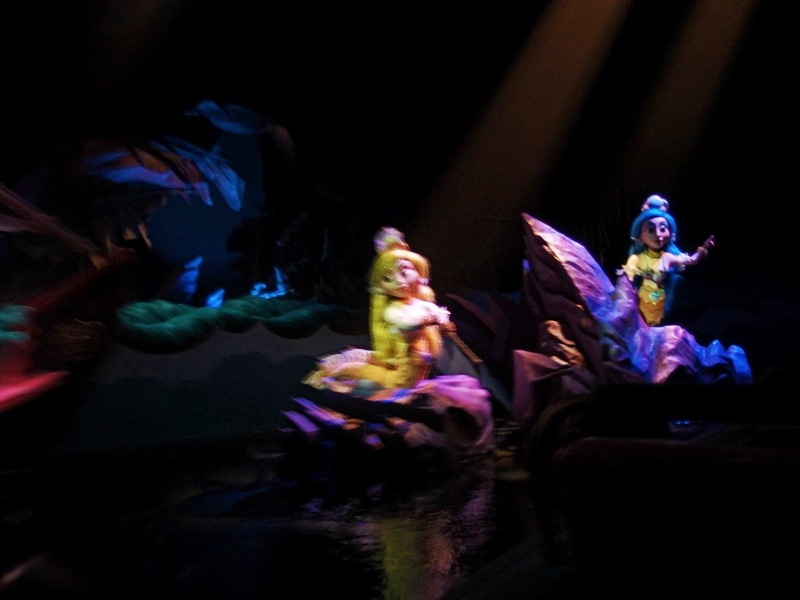 In Mermaid Lagoon, the children can play and it includes a live entertainment show. 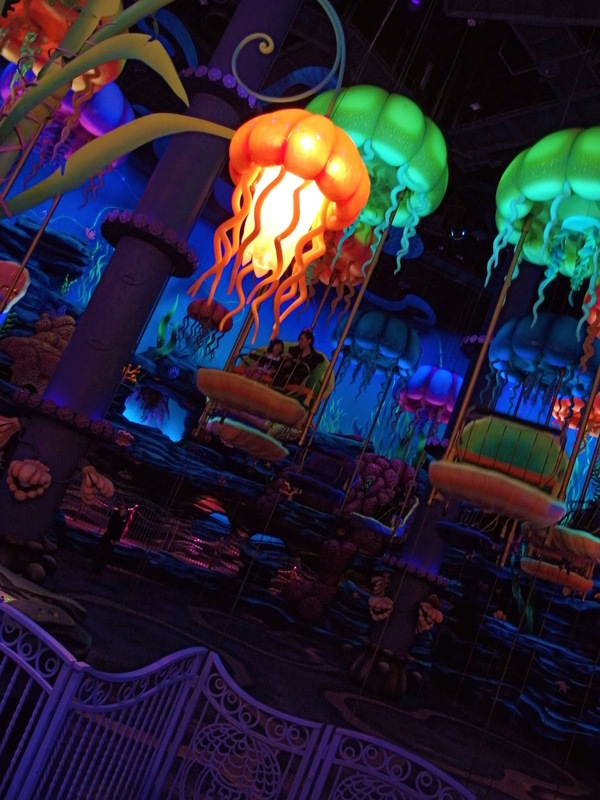 Jumpin’ Jellyfish is a parachute jump-style ride at Disney California Adventure in Anaheim, California and at Tokyo DisneySea in Urayasu, Chiba, Japan. 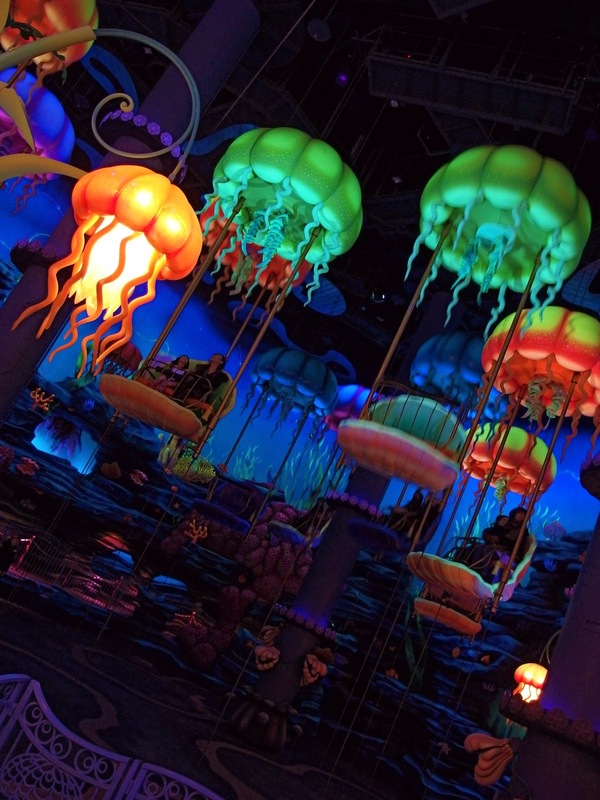 The name of the attraction came from the jellyfish-themed parachute rides, the bubble and 50-foot kelp-themed towers. 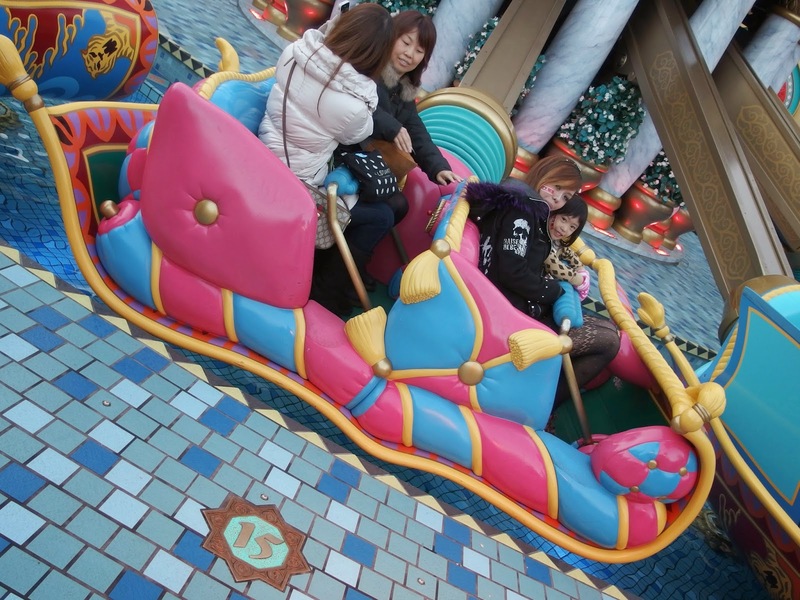 It is similar to the former Maliboomer, but scaled down to more child-sized proportions and rethemed. It stands 55 meters tall. 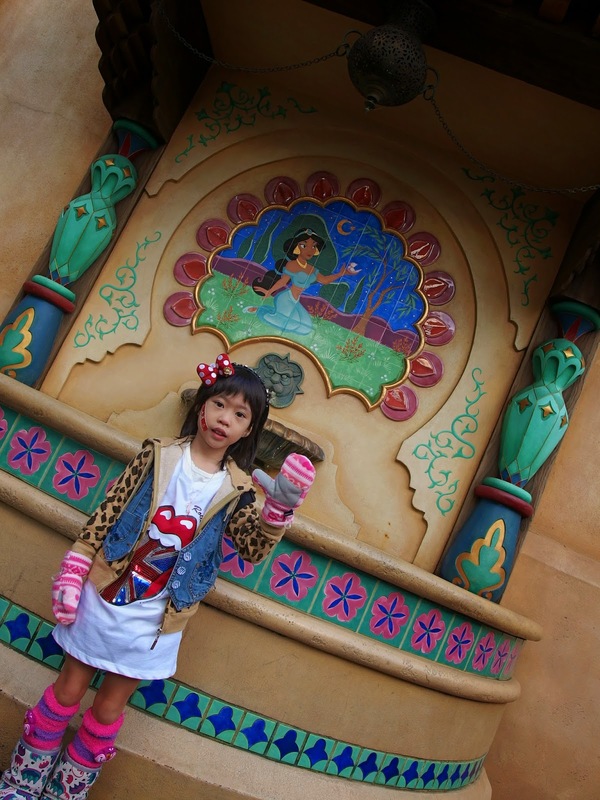 In Disney California Adventure, guests should be 102 cm or taller in order to ride but in Tokyo DisneySea, there is no height requirement for the ride. 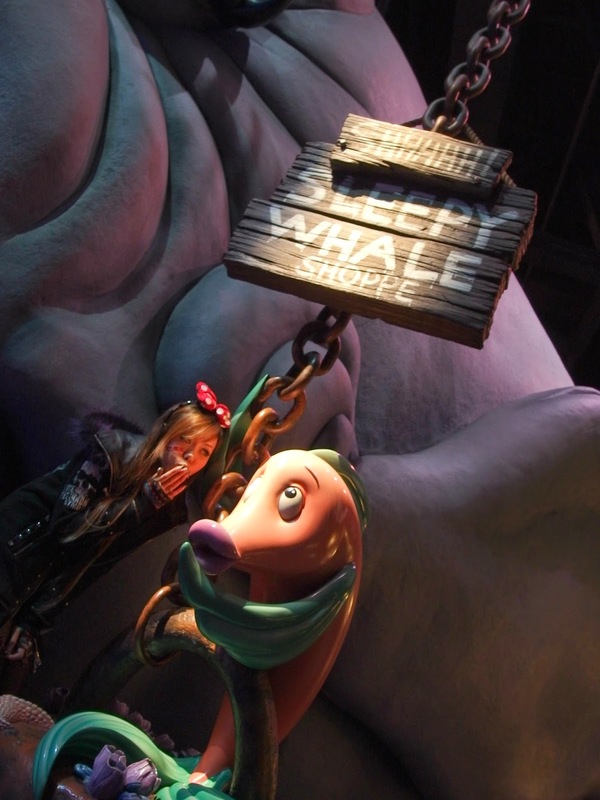 The name of the ride comes from one of Sebastian’s lines in The Little Mermaid. 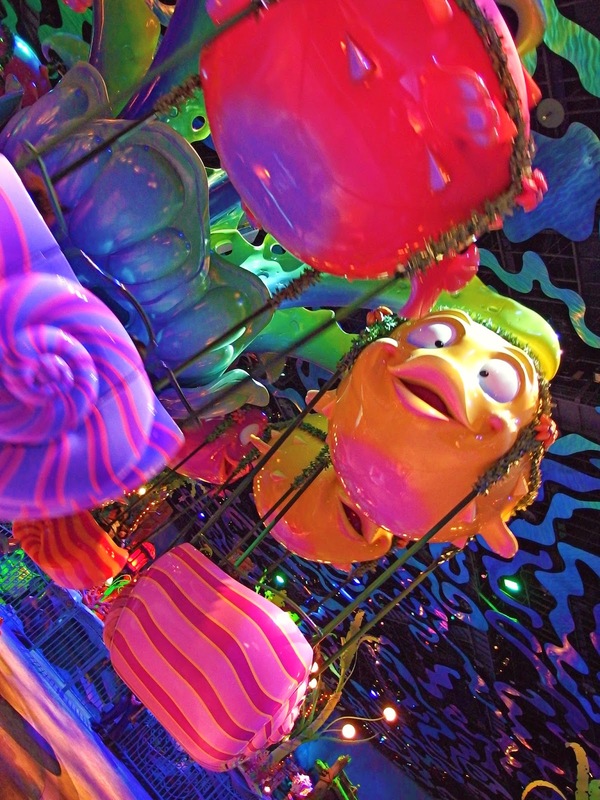 Blowfish Balloon Race is a spinner attraction at the Mermaid Lagoon of Tokyo DisneySea in Japan. 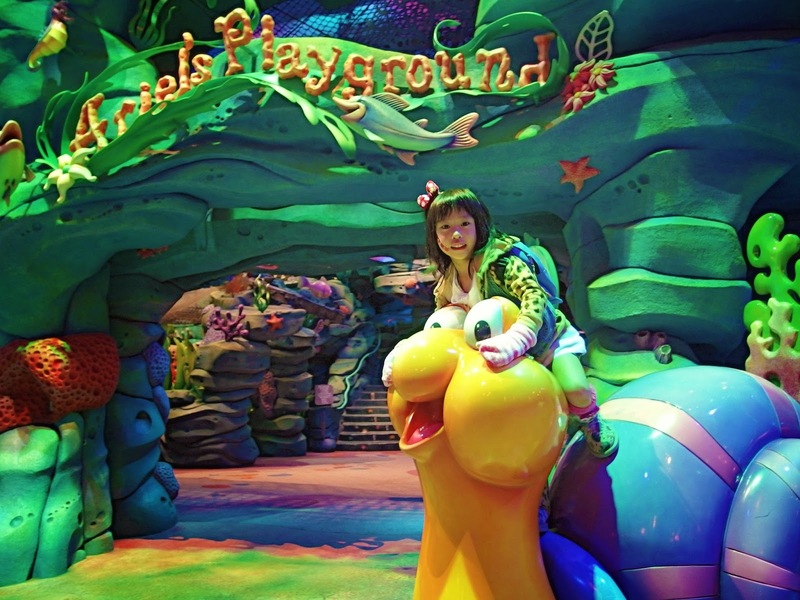 Guests ride a blowfish balloons which takes them around in a race. 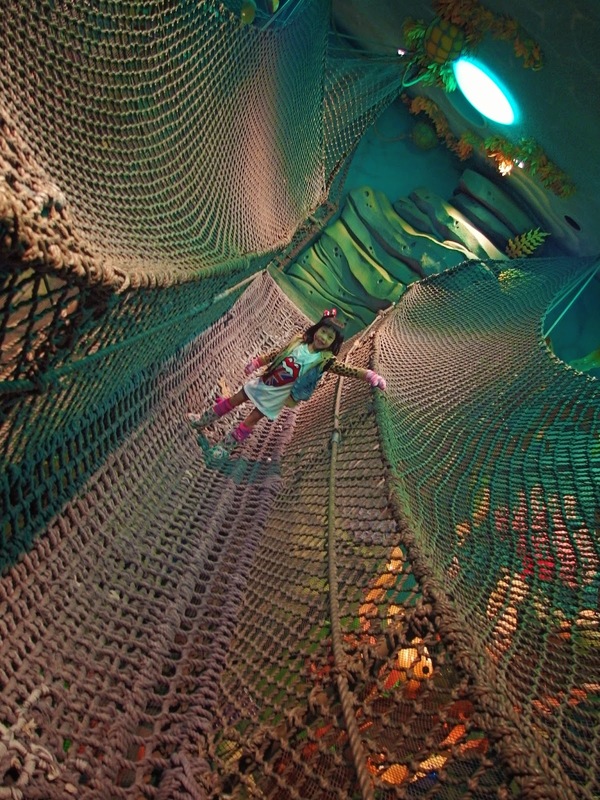 The ride is located adjacent to Jumpin’ Jellyfish. 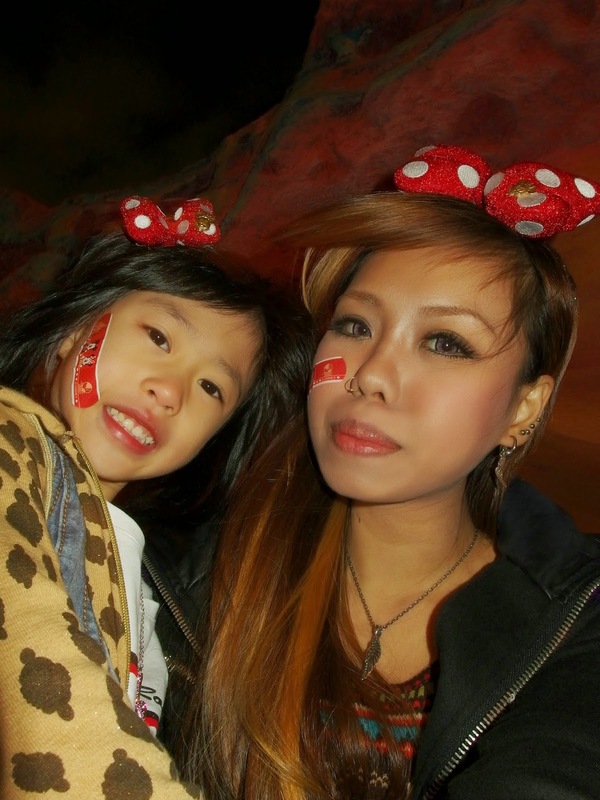 The attraction is also similar to Flik’s Flyers at the Disney California Adventure Park in Anaheim, California, USA. No describtion is need for this! Ariel’s Playground speaks for itself! Ariel’s Grotto is a restaurant at Disney California Adventure Park in Anaheim, California offering the opportunity for guests to dine with Ariel and several other Disney princesses. 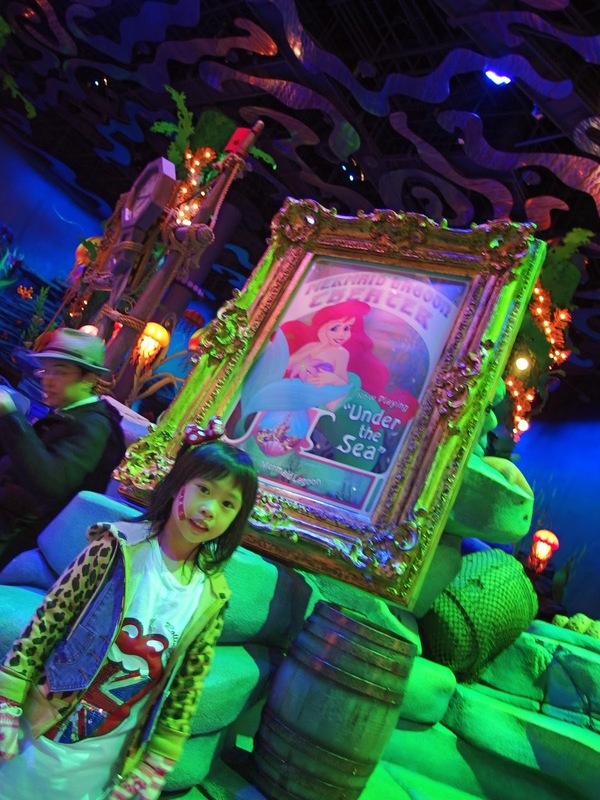 Ariel’s Greeting Grotto is a character meet-and-greet attraction at Tokyo DisneySea in Japan. 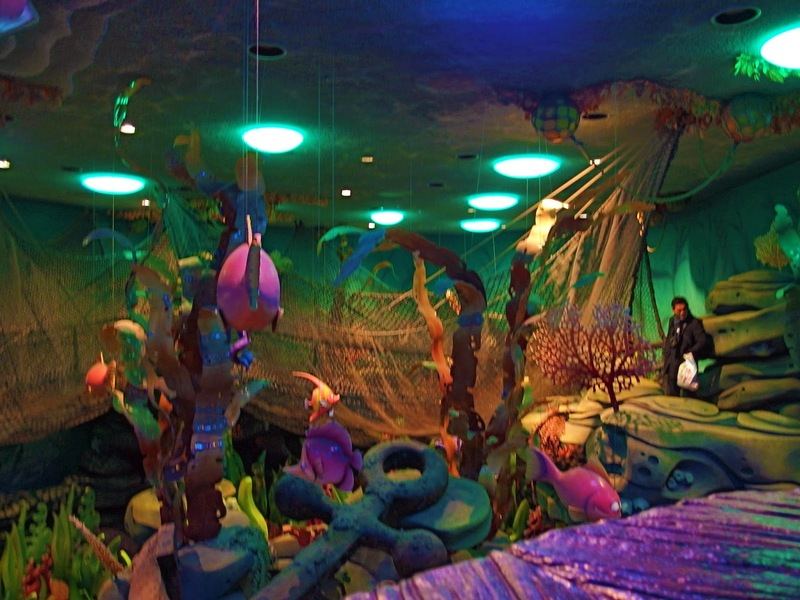 This colorful grotto based on The Little Mermaid is one of the few places for kids to get autographs and take pictures with Ariel in her mermaid form. The area is completely surrounded by starfish, coral, and waterfalls. 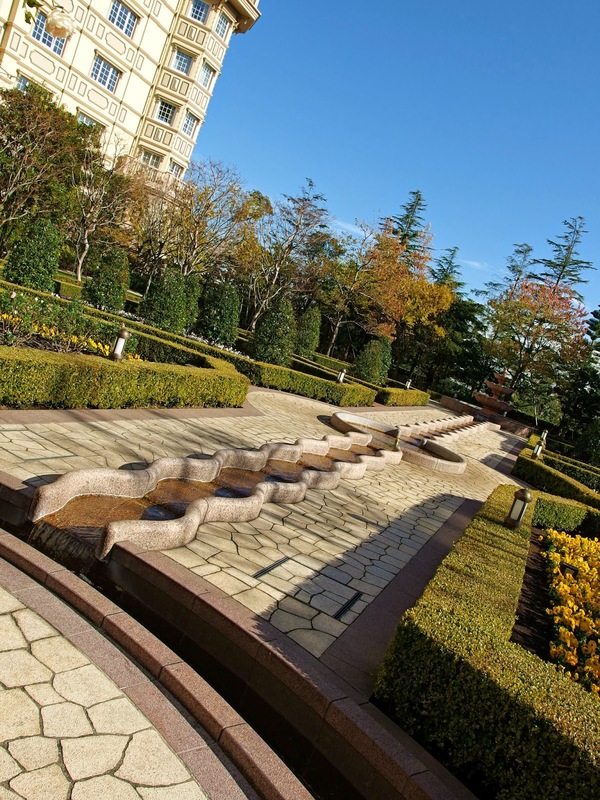 It is also used as a play place for kids, as it features a soft-surface play zone dotted with fountains. There is a sandy beach behind the grotto. 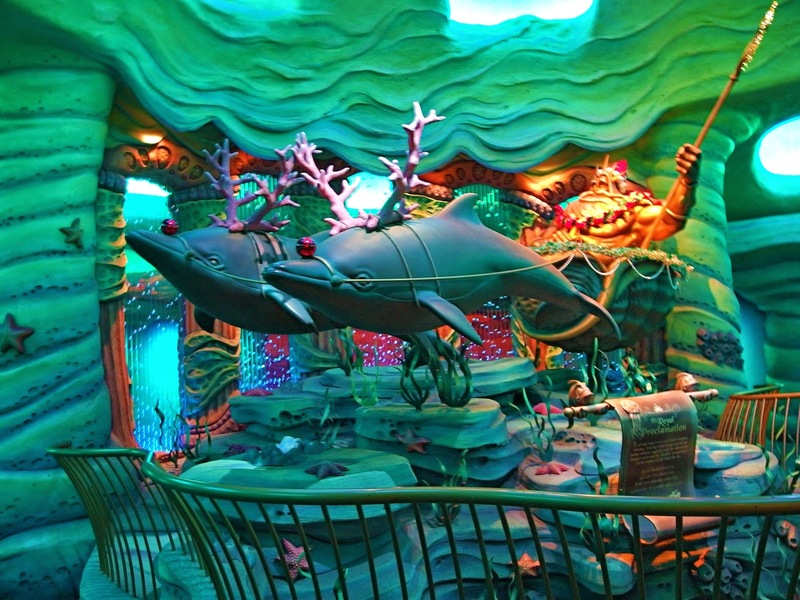 The original Magic Kingdom version utilized the closed 20,000 Leagues Under the Sea: Submarine Voyage lagoon as a backdrop, adding some additional rock-work and a statue of Triton emerging from the lagoon to the corner of the Grotto facing the water. 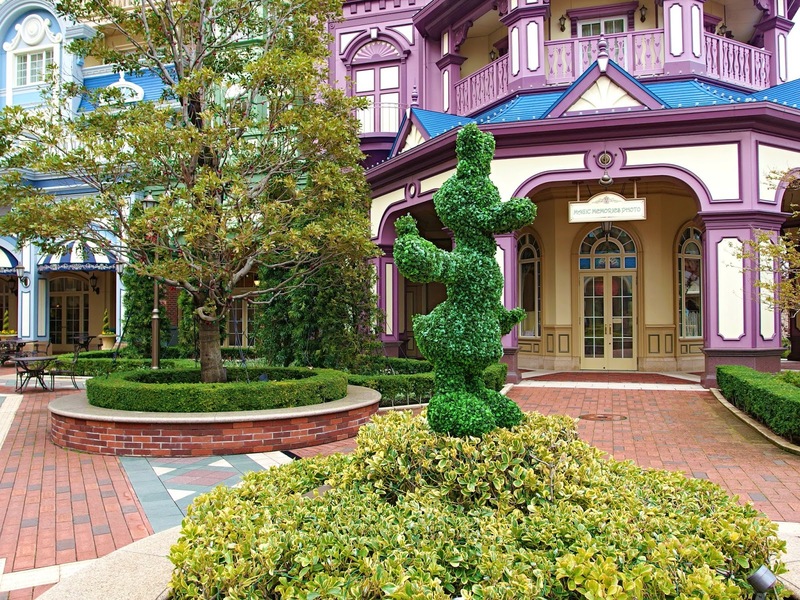 In August 2008, the area at Disneyland was closed. 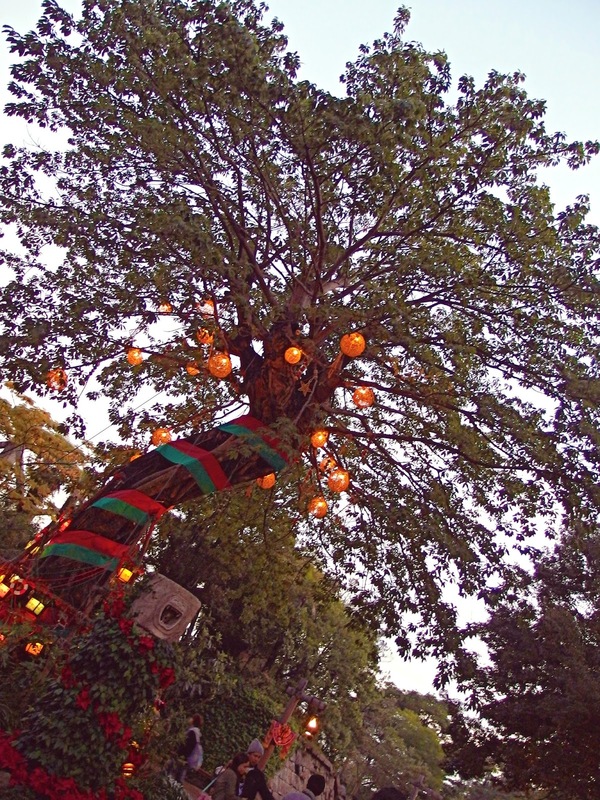 It was re-themed as Pixie Hollow, which is a Disney Fairies meet-and-greet attraction. 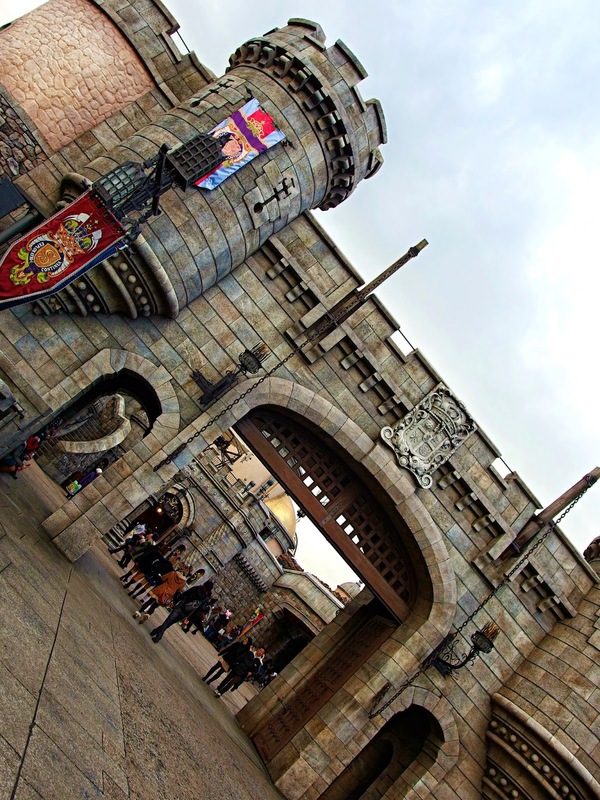 In April 2010, the area at Walt Disney World’s Magic Kingdom was closed. 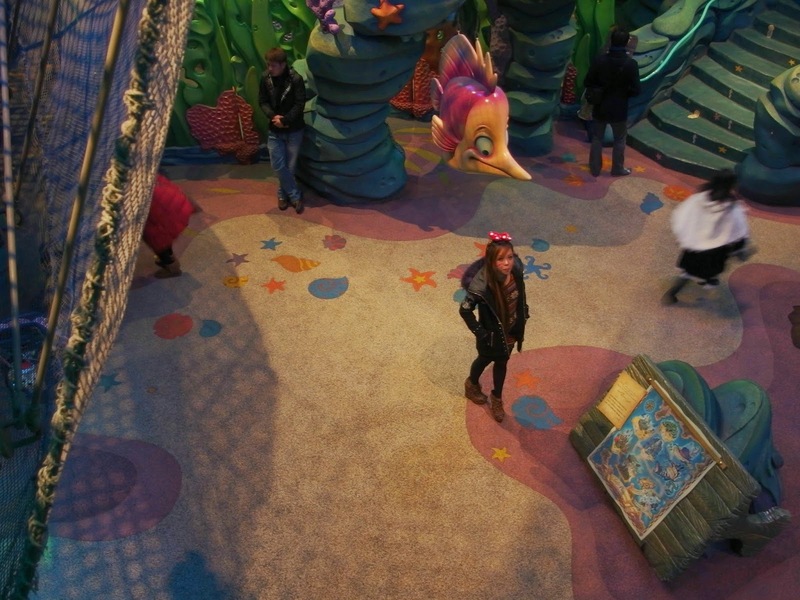 It was later reincarnated next to the Under the Sea: Journey of the Little Mermaid ride. This new location travels through sea caves at the base of Prince Eric’s Castle before arriving at the Grotto to meet Ariel. 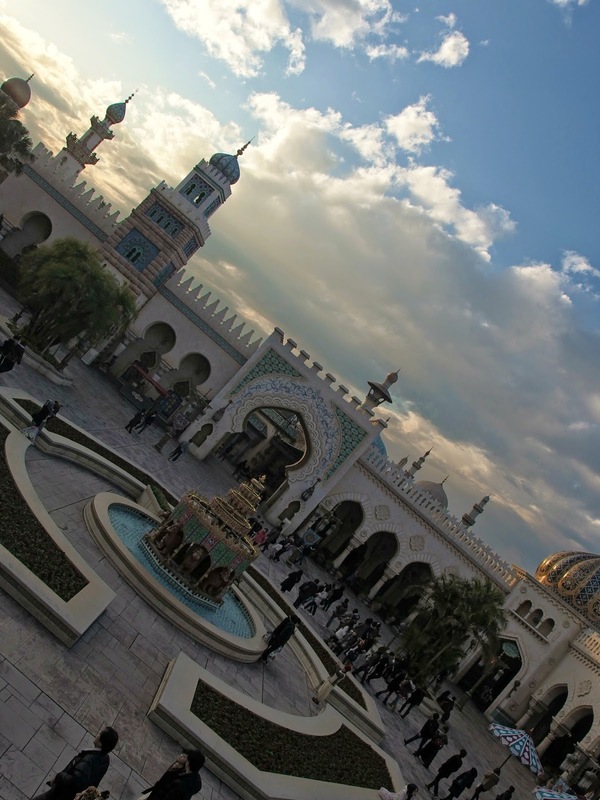 Arabian Coast is a “port-of-call” (themed land) at Tokyo DisneySea in the Tokyo Disney Resort in Japan. 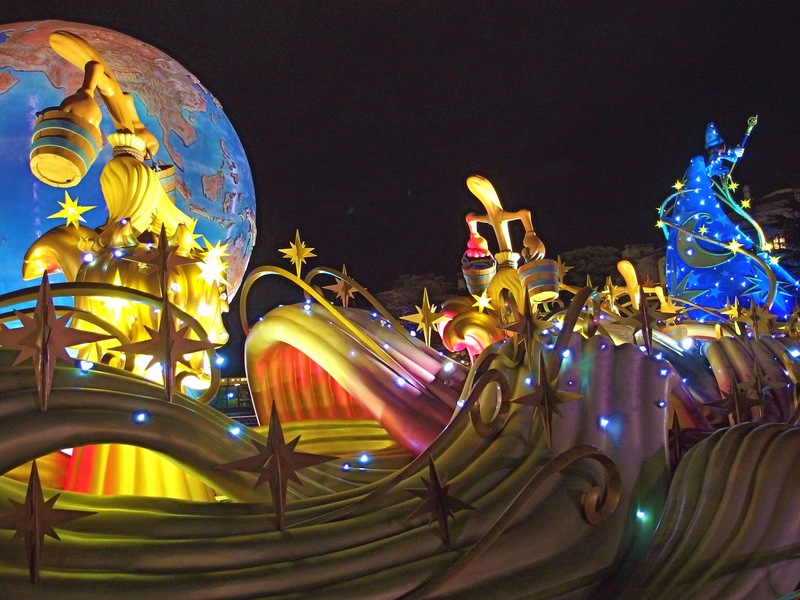 It is an Agrabah-themed land, mainly based on the 1992 Disney film Aladdin. 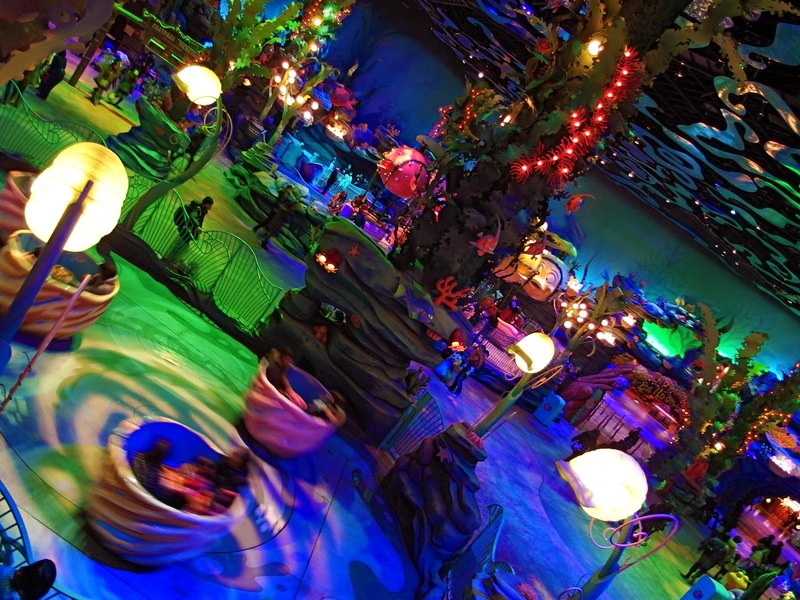 It recreates an exotic Arabian harbor combined with an “enchanted world from 1001 Arabian Nights.” A large eatery serving Middle-Eastern, Indian, and Japanese style curry, is at the center. 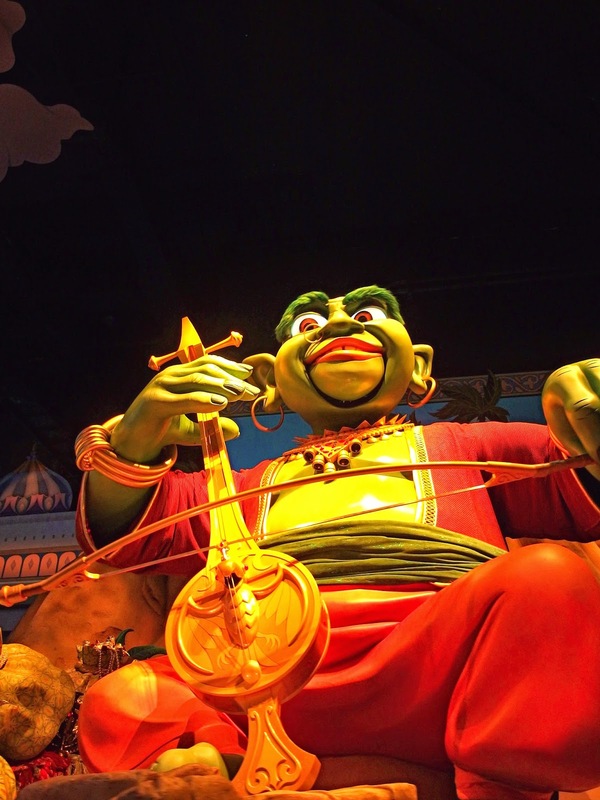 There are three attractions in the land: Sindbad’s Storybook Voyage, an indoor boat ride whose art direction seems to be at first glance a variation on “it’s a small world” – complete with its own theme song, composed by Alan Menken. 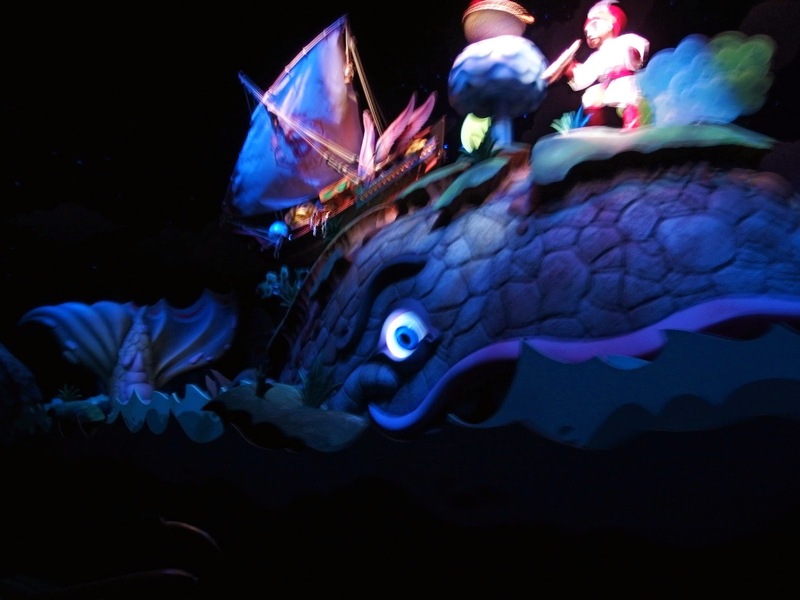 But all these are actually because of newly developed audio animatronics which, despite their miniature scale, have a full range of movement just like Pirates of the Caribbean’s life-size figures; ends up even surpassing the technical accomplishment of the classic Pirates of the Caribbean. 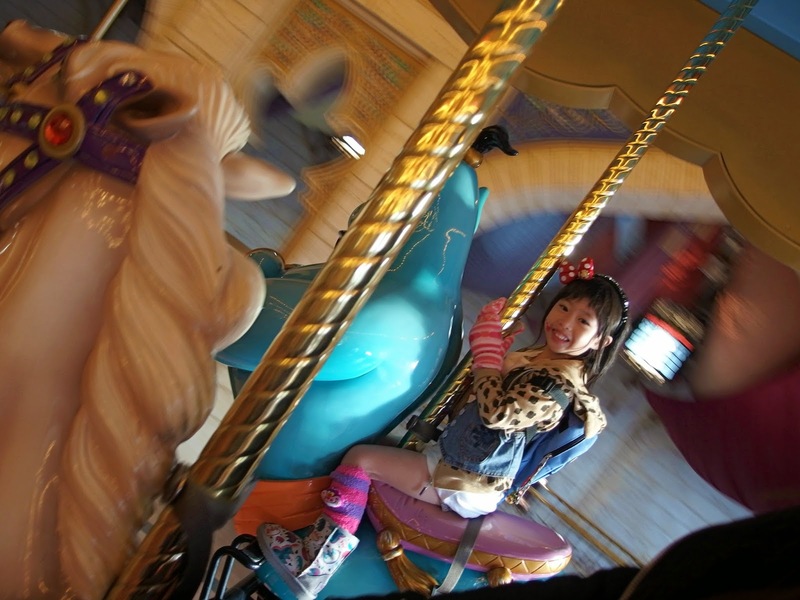 And Caravan Carousel, a double-decker carousel that can hold over 190 passengers; and the Magic Lamp Theater, which houses a combined live-action/animatronic based magic show with a 3D movie featuring the Genie. 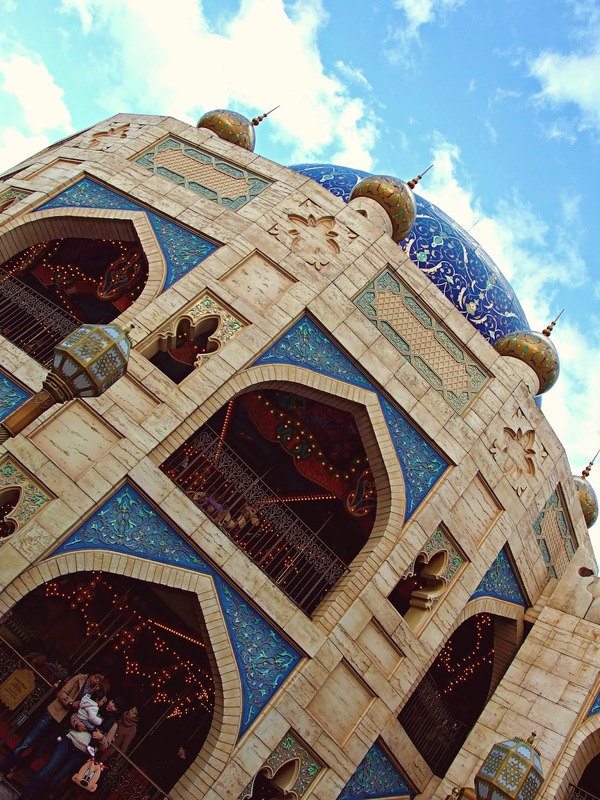 Arabian Coast is the third Agrabah-themed land in a Disney park, the first being Adventureland Bazaar in Disneyland Paris. 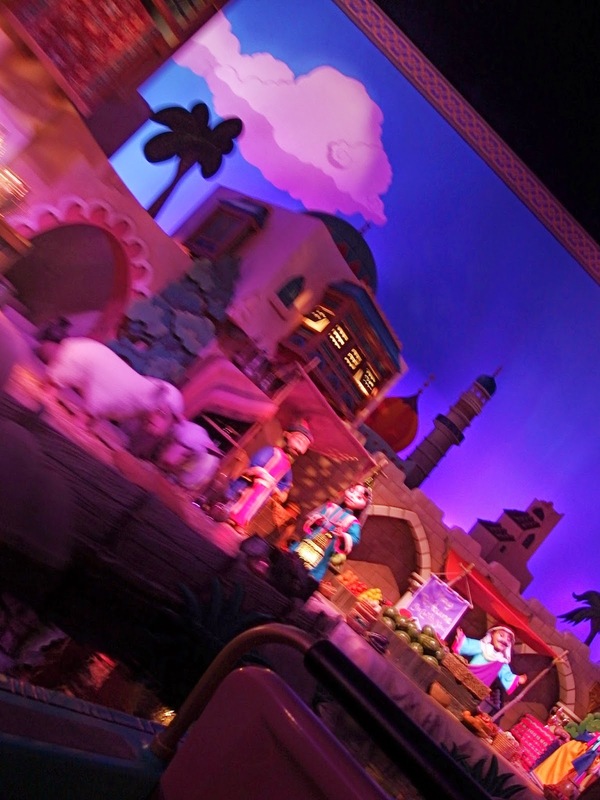 And the second of which – is a recreation of the city in the Adventureland of Magic Kingdom where The Magic Carpets of Aladdin is located. 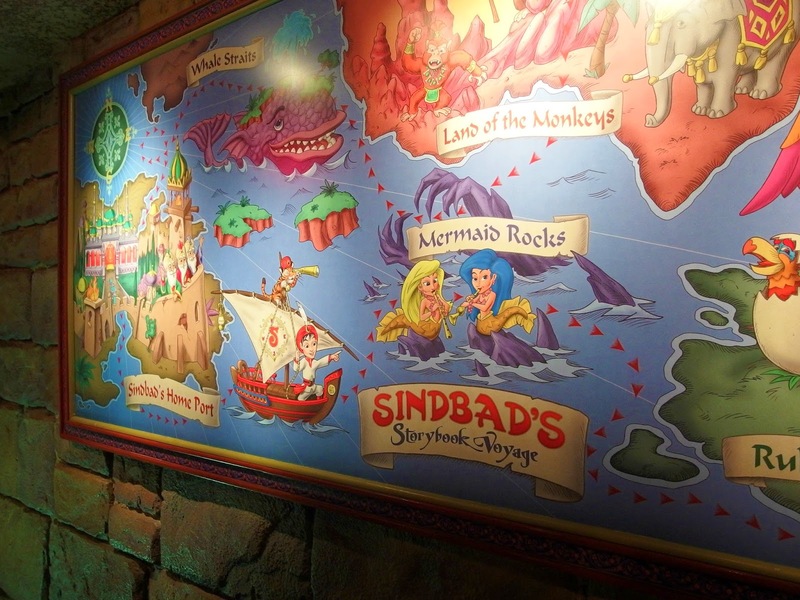 Originally, the ride Sinbad’s Seven Voyages recreated many Sinbad’s adventures from the tale. 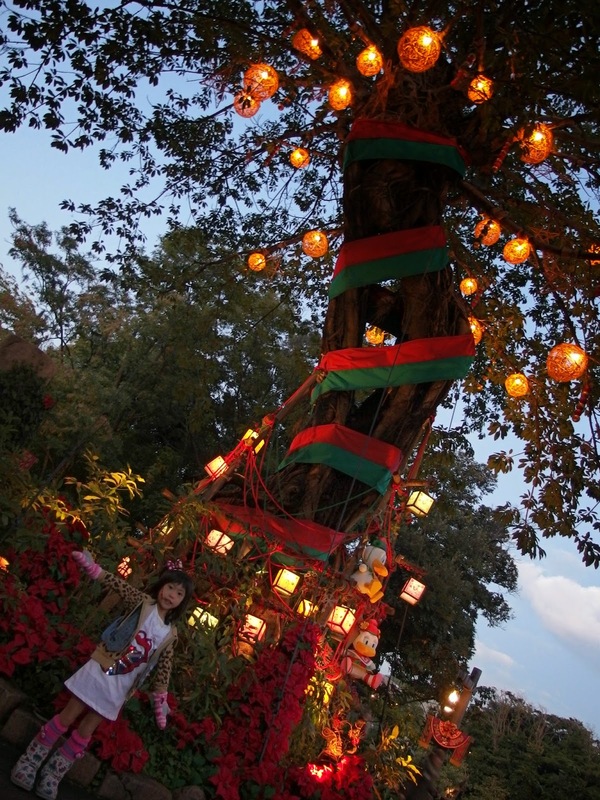 Since it’s refurbishment in 2007, it features a whole new adventure, especially designed for children. 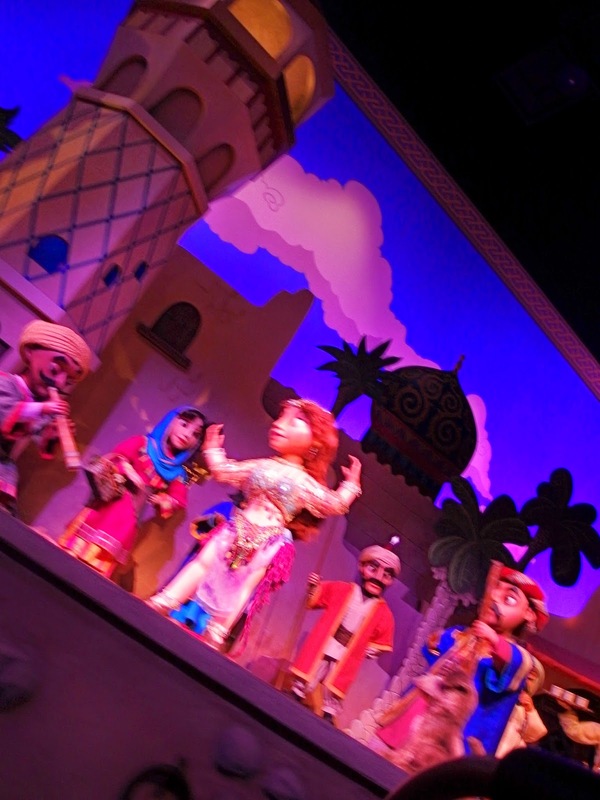 The Magic Carpets of Aladdin is a ride in the Magic Kingdom, at Walt Disney World. 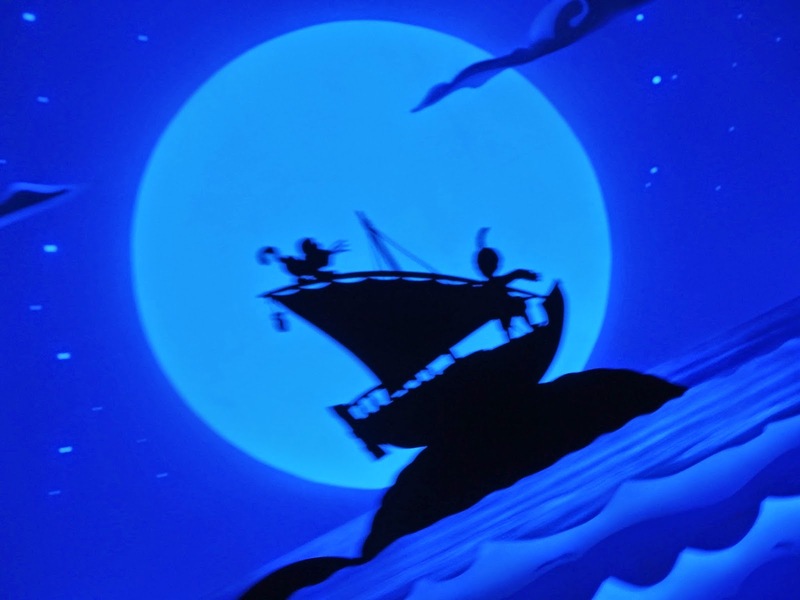 It is based on the 1992 film, Aladdin. 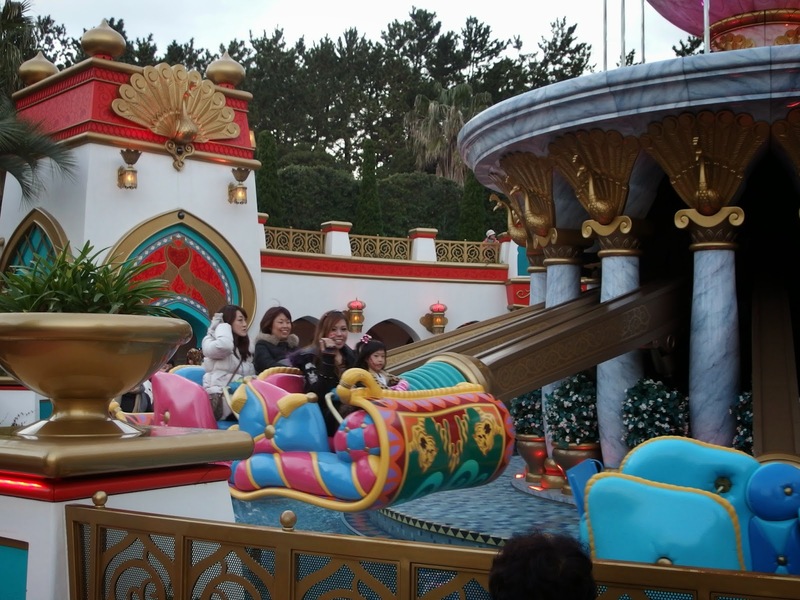 It is similar to the ride Dumbo the Flying Elephant, in that riders in the front rows control how high their carpets fly, and the ride lasts about 90 seconds. 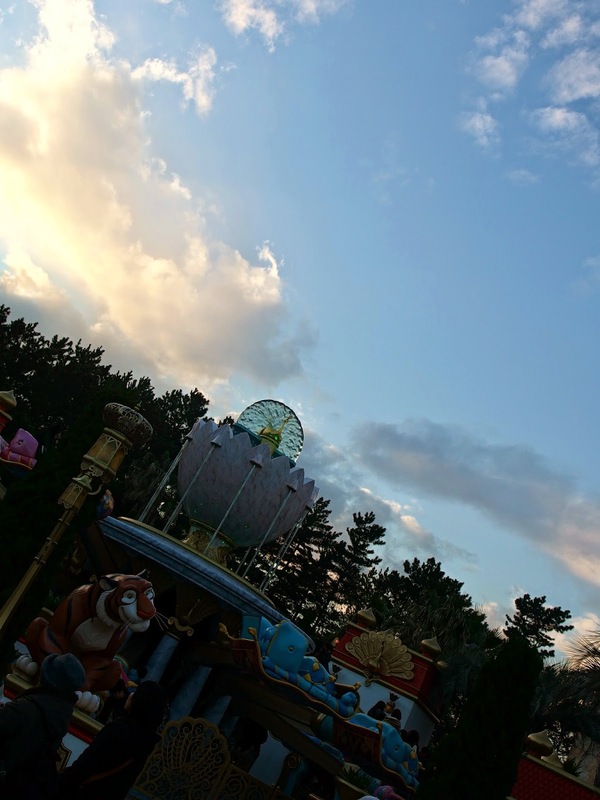 There is Aladdin’s magic lamp at the top, rather than Timothy Mouse. At the entrance, there is a camel that squirts people as they walk by, much like the Stitch figurine outside World of Disney shop, also in Walt Disney World. 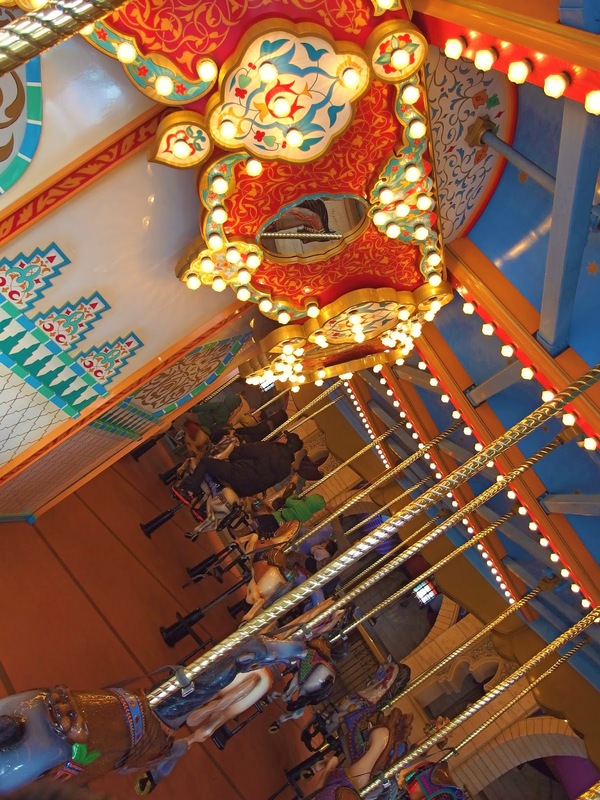 Guests who have visited Adventureland before may notice that this land has a new special look. The different shops look like the marketplace buildings from Disney’s Aladdin. 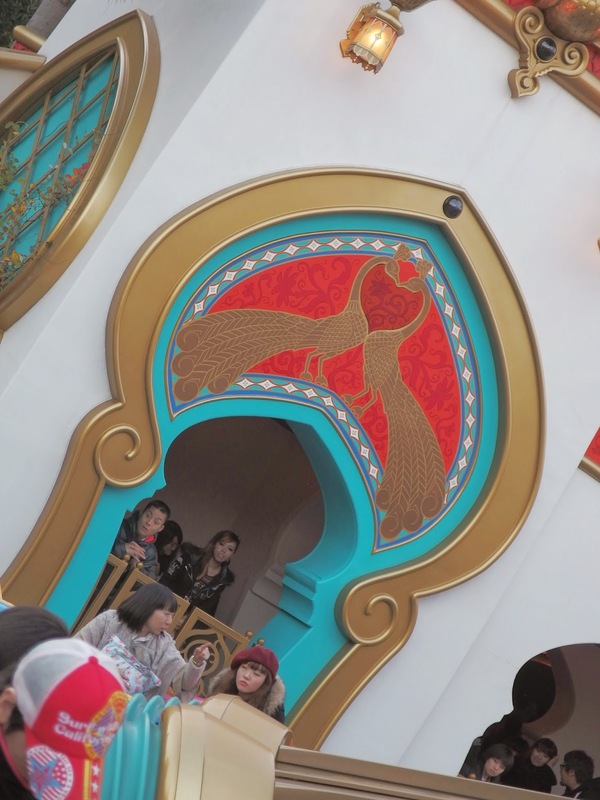 Different characters from Aladdin are in some of the buildings to do meet & greets and sign autographs. 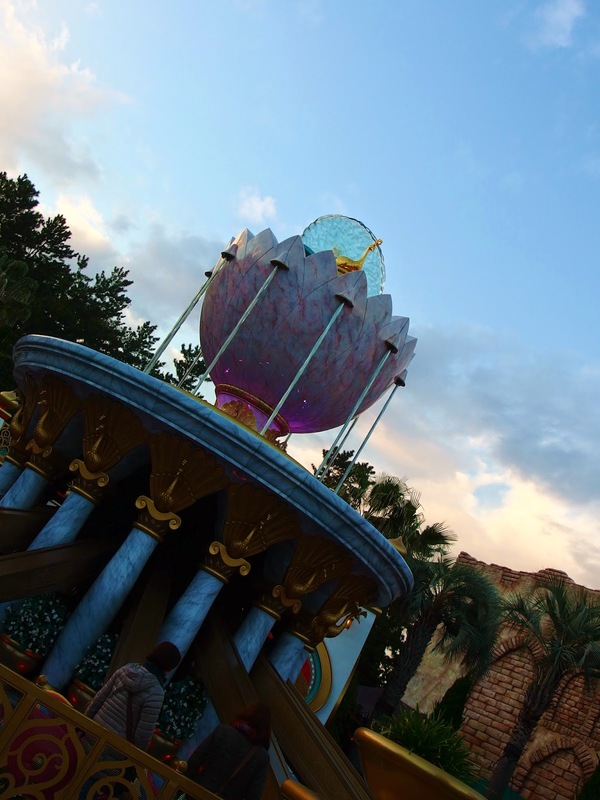 The attraction also opened at Walt Disney Studios Park in Disneyland Paris on March 16, 2002 under the title Flying Carpets Over Agrabah. 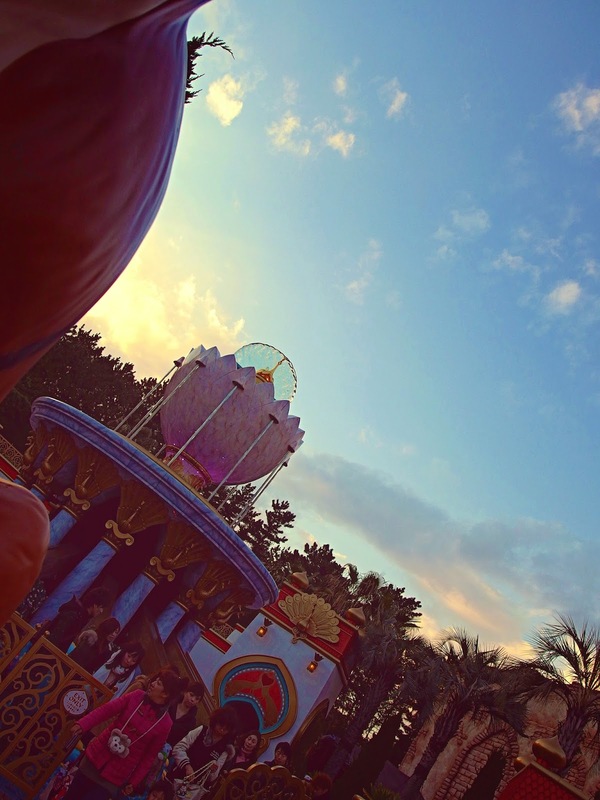 The attraction is set against a large “movie set” backdrop of Agrabah, with guests playing as the extras in Genie’s directorial debut. 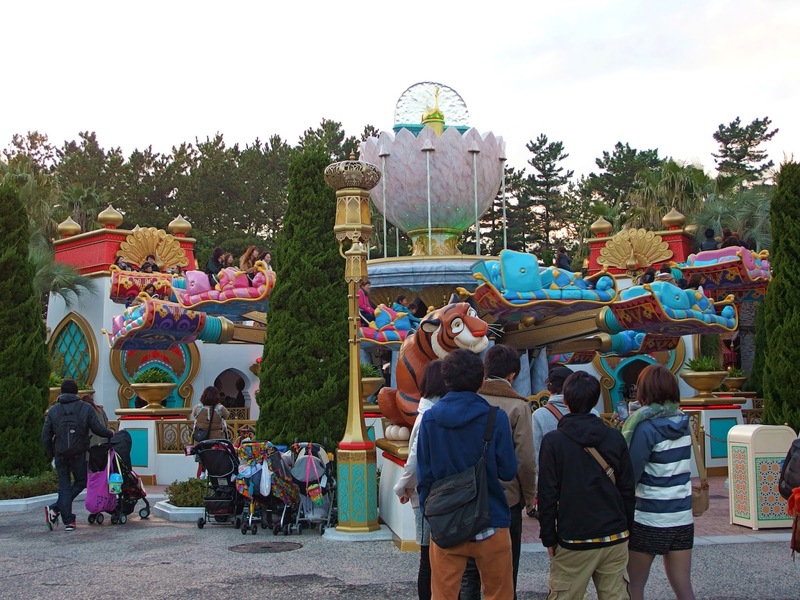 A third version of the attraction opened at Tokyo DisneySea at the Tokyo Disney Resort on July 18, 2011 (4 months after the 2011 Great East Japan Earthquake and Tsunami) under the title Jasmine’s Flying Carpets. 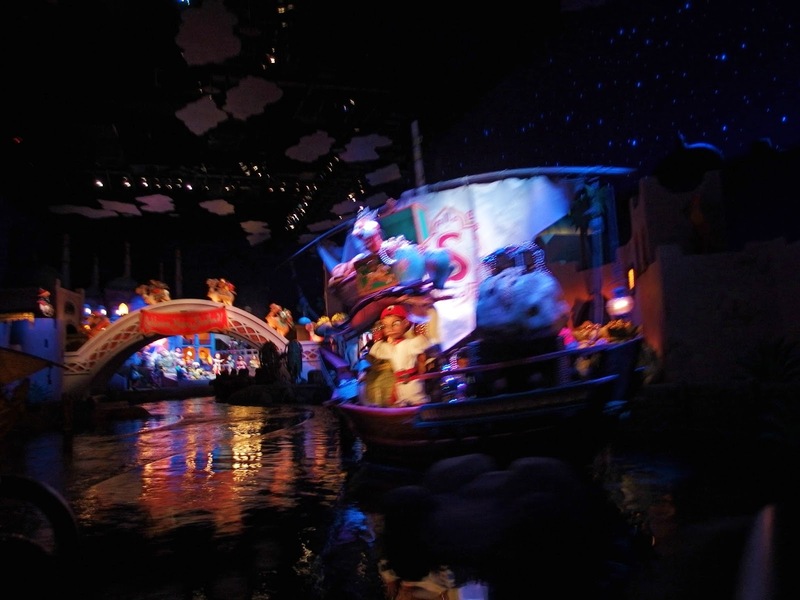 The attraction is next to Sindbad’s Storybook Voyage. 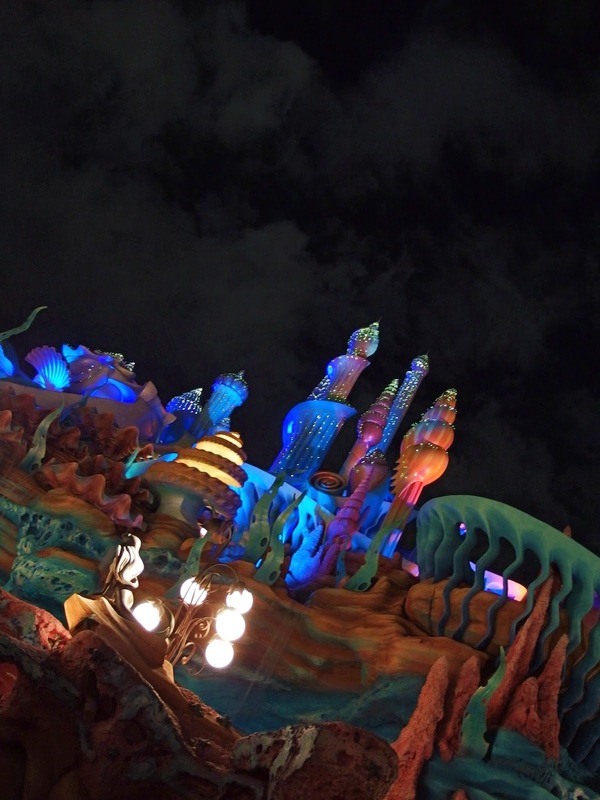 It was opened uniquely for Tokyo DisneySea’s 10th anniversary celebrations. The Magic Carpets of Aladdin is based on the hit Disney animated feature Aladdin. 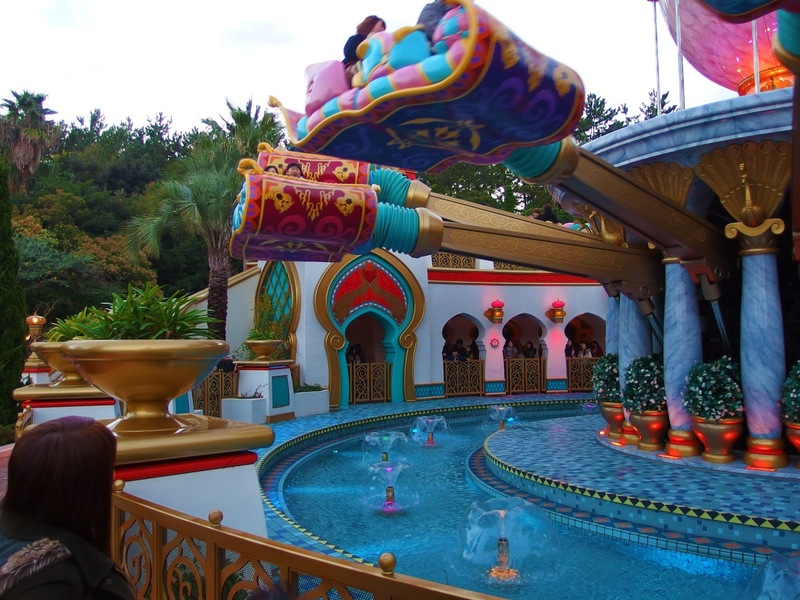 The story continues at the park as the lovable Genie, in a fit of flight and fancy, has conjured up an entire fleet of magic carpets (16 in all) for adventure-seeking Guests to experience on this attraction. 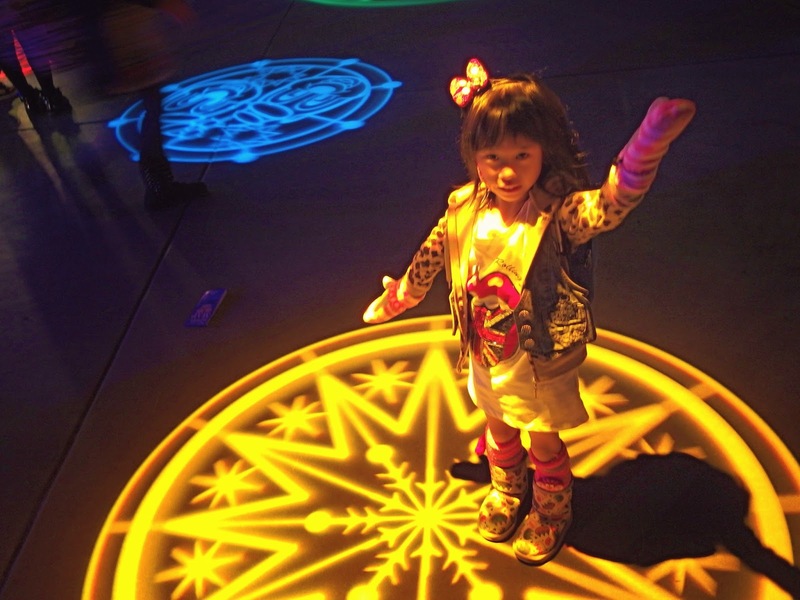 Take off on a magical ride above a bustling bazaar aboard an enchanted carpet that you control. Climb aboard a colorful, 4-passenger vehicle and take off into the air as the strings of Middle Eastern music play overhead. 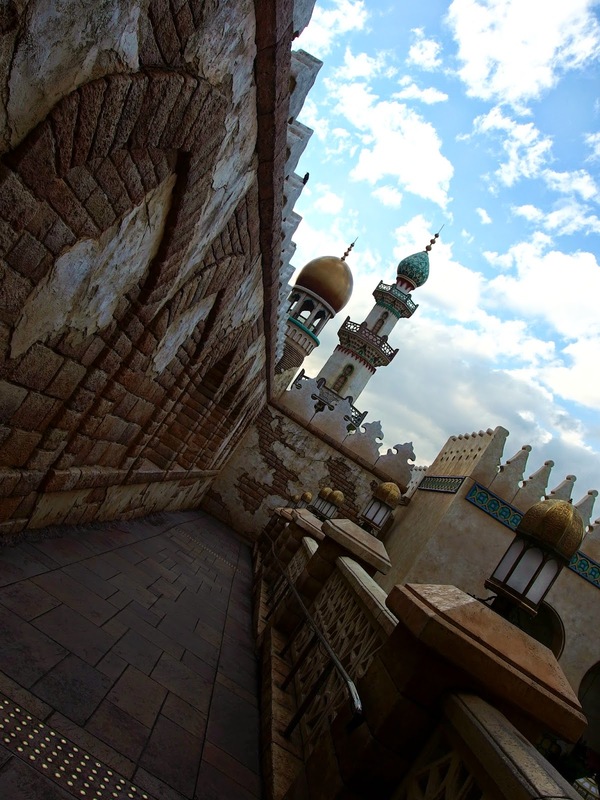 Rotate around a giant genie bottle and magic lamp—bobbing up and down, forward and back—as the lush flora and weathered walls of the bazaar whirl by below. But be on the lookout: An unruly camel who likes to occasionally “spit” water at flying carpets has been seen nearby! 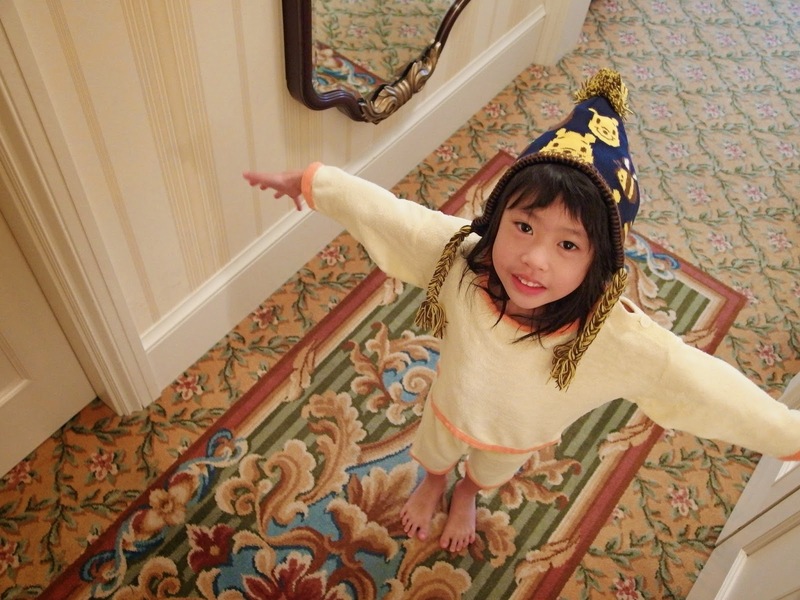 As the master of your very own flying carpet, you are in control of your flight. If you’re seated in the front row, direct how high or low you fly by moving an onboard lever up or down. If you’re sitting in the back row, pressing a magic scarab will tip your flying carpet forward or backward. 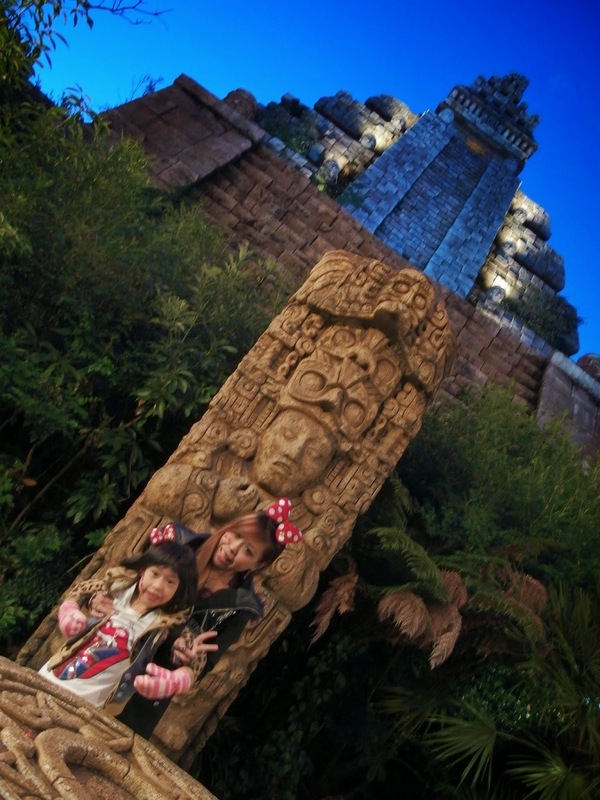 Lost River Delta is a “port of call” – a themed land at Tokyo DisneySea at the Tokyo Disney Resort in Japan. Located at the back of the park, the dominant structure of Lost River Delta is a huge, ruined Central American Aztec pyramid which houses the attraction Indiana Jones Adventure: Temple of the Crystal Skull. Also located in the Lost River Delta is the DisneySea Transit Steamer Line which transports guests back to Mediterranean Harbor, “Mystic Rhythms” is a live theatrical show that takes place at the Hangar Stage, an abandoned hangar that has been reclaimed by the jungle. And Lastly, Raging Spirits, a steel roller coaster situated in the ruins of an ancient ceremonial site. 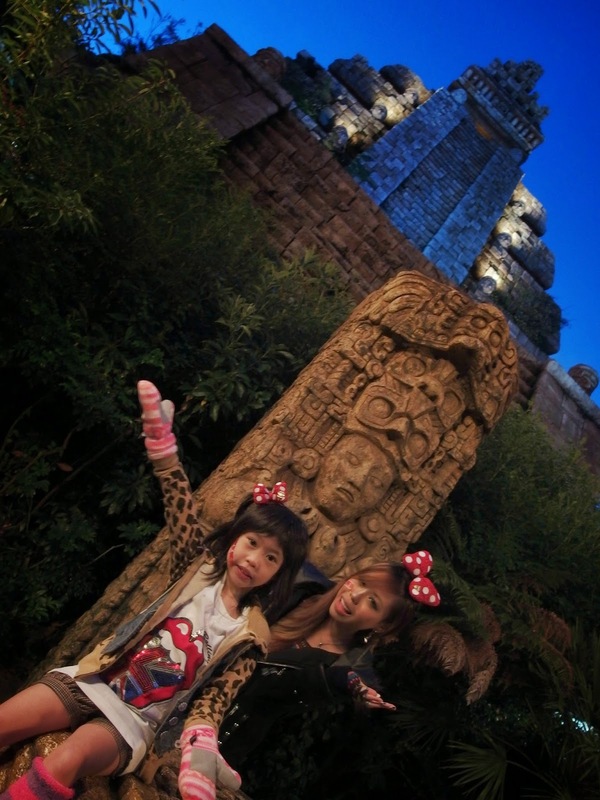 Indiana Jones Adventure: Temple of the Crystal Skull is a dark ride in Tokyo DisneySea in Urayasu, Chiba, Japan. It opened September 4, 2001 (together with the park). It is based on the Indiana Jones series. 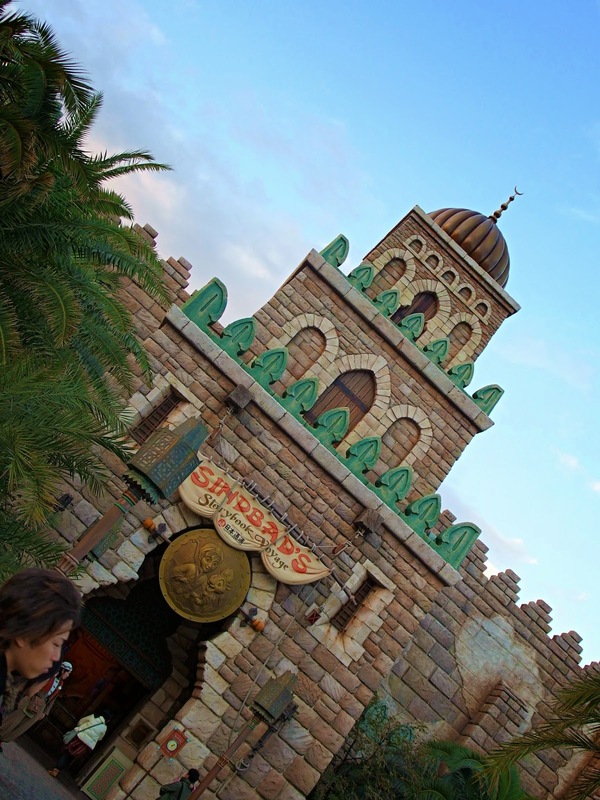 In the ride, guests accompany archeologist Dr. Indiana Jones on a turbulent, high-speed adventure through a dangerous lost temple aboard military transport vehicles. Guests ride board an EMV (Enhanced Motion Vehicle) and embark on a voyage into the Temple of the Crystal Skull. They go to the Chamber of Destiny and go through some doors. They proceed into the Hall of Promise, where there are elements from all of the paths in Indiana Jones Adventure: Temple of the Crystal Skull: they have statues holding gold, a dazzling star field overhead, and pictures of people drinking from the Fountain of Youth. Here, the crystal skull shoots out plasma beams from its eyes and sends the passengers to the Tunnel of Torment, which leads to the Gates of Doom. There, Indiana Jones is holding the gates shut, as the military transport appears to float, as lightning crackles around the walls of the chamber. 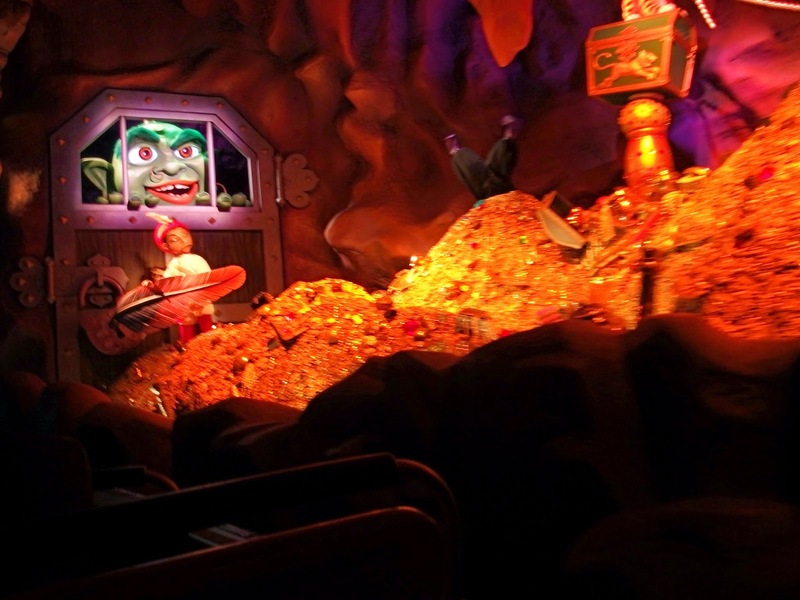 The transport then swerves left to look onto the Main Show Building, where a giant stone skull blasts them, but misses. 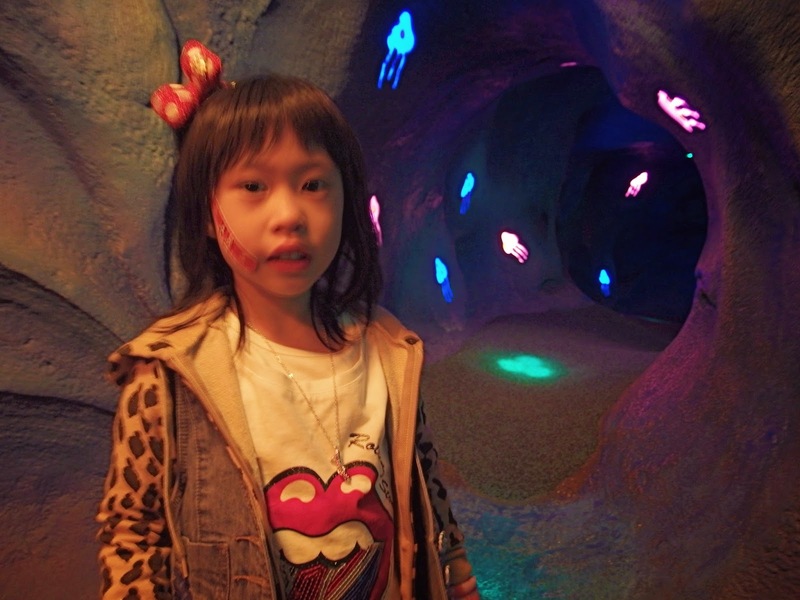 They then head to the Mummy Chamber, where mummies pop out at the guests. They then proceed to the Bug Room, where projectors project bugs on the wall, and puffs of air our sent onto the rider, simulating bugs landing on them. Guests then across a rope bridge, where the skull shoots at them again. 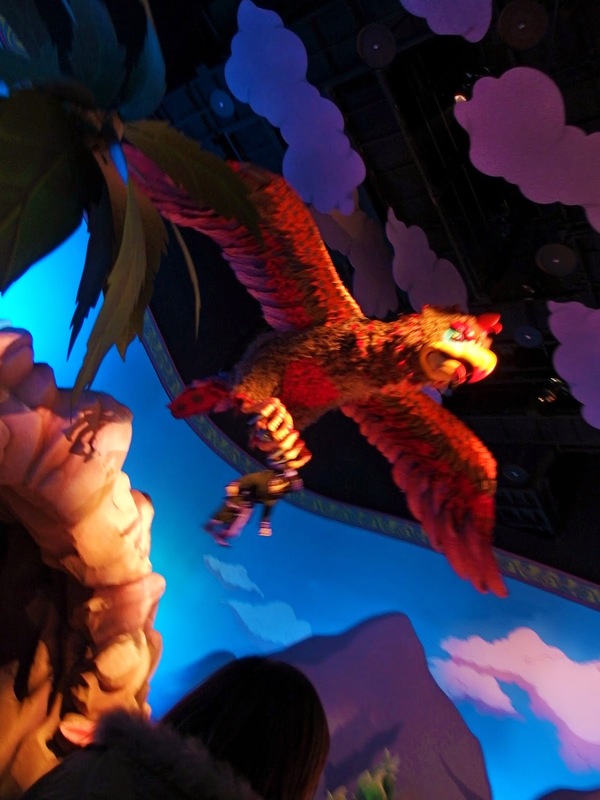 They head into the Snake Temple, where a giant Mesoamerican deity named Quetzaloatl attacks the riders. They start to head across the bridge again, but instead swerve to the left and into the skull, where the crystal skull looks menacingly on them. They go into a room with a large stone face, which blows a puff of presumably poison air at them. They then go into the Dart Corridor, where carved heads inside mouths start blowing darts at the guests. Finally, they meet up with Indy at the Boulder Room, where a rolling boulder comes at them with strobe lights to make it appear that it is going to crush them. They have no choice but to back up and go under the boulder as a picture of them is taken! They then see Indy next to the crashed boulder, issuing one of his prerecorded phrases. 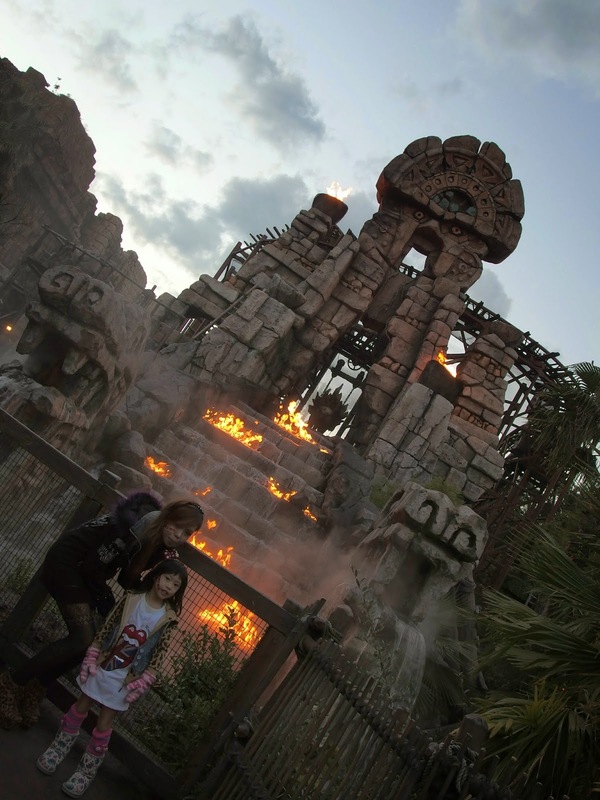 Raging Spirits is an attraction at Tokyo DisneySea in the Lost River Delta area. 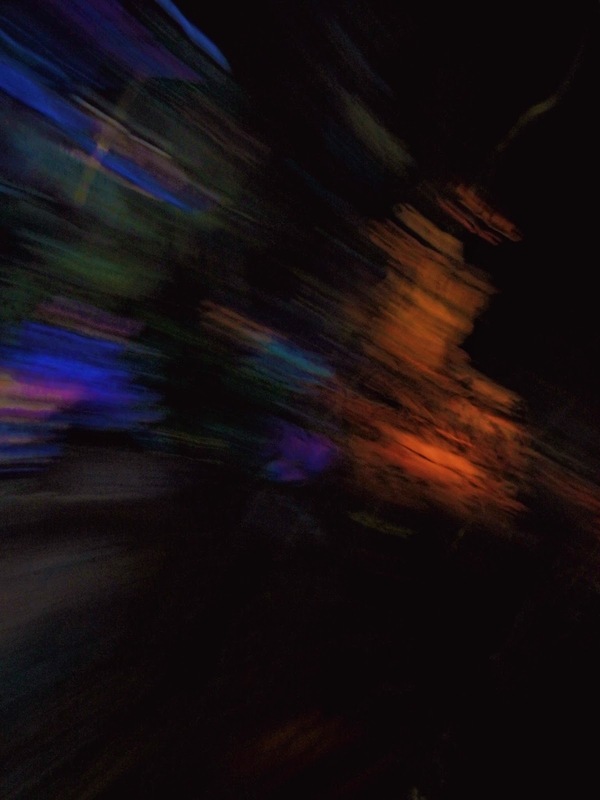 Copying the track layout of Disneyland Paris’s Indiana Jones et le Temple du Peril, it goes with an Incan ruins theme inspired by The Emperor’s New Groove. A group of explorers were wandering around the jungle when one day they stumbled upon a 5,000 year old site, one with idols, a large temple and two altars, one of fire, one of water. However these explorers were not Indiana Jones, and during their excavation they made a few mistakes. Their biggest mistake came when they were reconstructing the altar of water. They installed the last piece of the water god’s head backwards so it faced the fire god, a big no-no. The result? Cauldrons erupting with fire and water spewing out of idols. Good morning everybody! 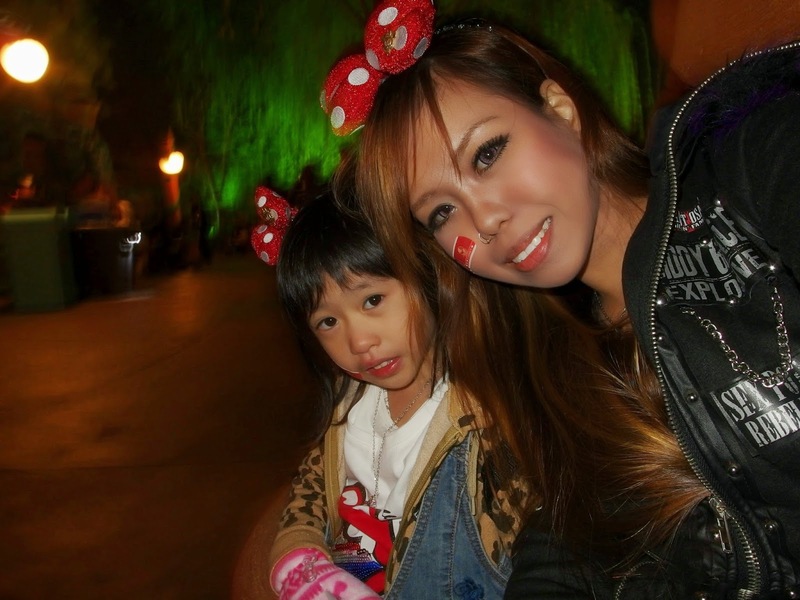 It’s our last day at Disney….